Are you doing everything you can to take advantage of the traffic your website receives each day? 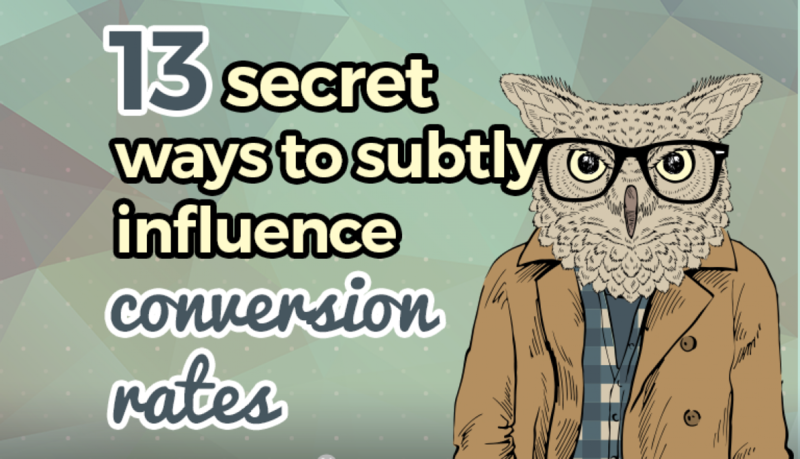 Maybe you already have tried all the obvious ways to influence conversion rates. You can contrast the color of key page elements or vary the size of your call-to-action, but when you’ve exhausted the basic tricks it’s time to get creative. Conversion Rate Optimization (CRO) is integral to succeeding in an online marketplace, no matter what product or service you are selling. Here are a baker’s dozen of subtle changes – backed by a bit of science, no less – that are sure to improve your odds of getting what you want out of your site’s visitors. Less is more, especially when it comes to convincing people to fill in their information. One case study showed that even as little as a single additional field to fill in can cost you conversions, in the ballpark of an 11% decrease. When seconds are valuable and a moment’s decision makes or breaks your conversion effort, facing your visitor with as little upfront work as possible is a great start to improving your website’s odds. But what should you do when you want more than the bare minimum from your users? These fields don’t necessarily need to all disappear! Once a guest has already made their decision to provide you with their email, it is much easier to secure a name and other necessary information in subsequent forms that are initially hidden. This plays into a stubborn tendency of the human brain known as the “sunk cost fallacy.” We are all more likely to see a menial task through once we’ve started, even if it exceeds what we would have originally considered reasonable. This is a powerful tool, with one case study showing as much as a 743% increase in CRO from the use of multi-step forms. With this trick, tackle new forms and revise old ones with a new type of “divide and conquer” philosophy in mind! Nobody wants to slog backwards through a form they’ve worked to fill out, only to find that some minor error needs to be corrected. We’ve all seen real-time for validation in action, rejecting passwords we’d easily remember in favor of ones we need to reset every time we log in. There is something to say for real-time validation’s efficacy, though, with a 22% increase in conversion rates, and get this – a 22% decrease in errors made – in one case study. Like many items on this list, this is easy to implement, too. Make sure all emails follow the correct format and all passwords match as soon as they’re entered, and everyone involved will appreciate the reassurance. Sometimes you have to lose a little to gain a lot, and that is certainly the case when requesting your visitors’ phone numbers. One study revealed that providing some agency to the individual filling out a form yields massive gains: making the phone field optional more than doubled conversion rates overall, while costing only 37% of phone numbers. These are the sorts of decisions you need to make when you add a form of any kind to your site. Maybe next time you revisit your form design strategy, consider leaving more up to those on the other end. You’ll be surprised how much they’ll appreciate the option to skip a question. This article sums it up nicely: A captcha frustrates your human users in exchange for very little true protection from automated spam. For a long time they had been standard place on the Internet, but many have opted out of including captchas in recent years, and the benefits are clear. A 33% increase in conversion rates is nothing to scoff at, and to make it even better, you can have the benefit of a captcha at the same time you benefit from not having it. How? Try trapping spambots with a hidden field, known as a “honeypot” captcha. This is a hidden field that goes unseen by your users, but will be filled unerringly by robotic pests, putting you back in control again when you discard their rubbish information. Don’t be afraid to put some pressure on your customer and add a sense of urgency to their decision to place that order. 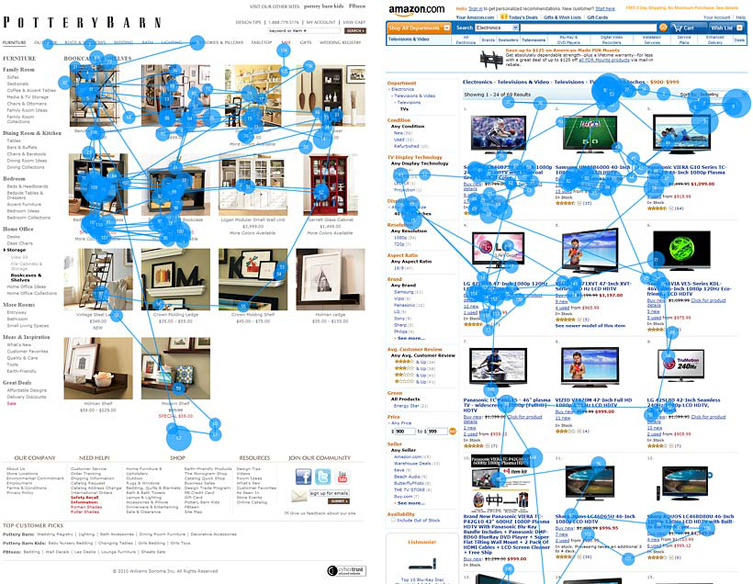 Sites such as eBay and Amazon do this well, harnessing a person’s desire to act in a way that keeps them in control. There’s nothing like a “Only 4 left in stock!” or “Want your order by ___? Order within ___ hours” to get people’s attention and drive an impulse purchase home. The web often doesn’t feel time-sensitive, but adding something as simple as a statement like this can lock a user firmly into a clock of your creation, where they run the risk of missing out – unless they do what you want them to. You’ve worked hard, and you want your users to see what you are about and what you’ve got to offer. However, when you are trying to hone your conversion rate, all page elements that do not directly contribute to that goal can be done without. This study shows how removing something as essential as a navigation bar was able to drive up a site’s conversion rate by over 100%. If you want to see similar results, consider whether your landing page is being overly-diluted by these elements, and A/B test the page without them. Humans are simple creatures, and we like simple layouts. Utilizing a single column to hold all of your landing page’s vital content, CTA, and forms gives it a natural flow as the user scrolls down the page, all while removing all those distracting elements I just mentioned. Don’t take my word for it, though. This study’s results speak for themselves, and a 681% increase in conversions makes this one of the most promising secrets in this post. Definitely make the single column layout a central tenet of your design philosophy for landing pages moving forward. 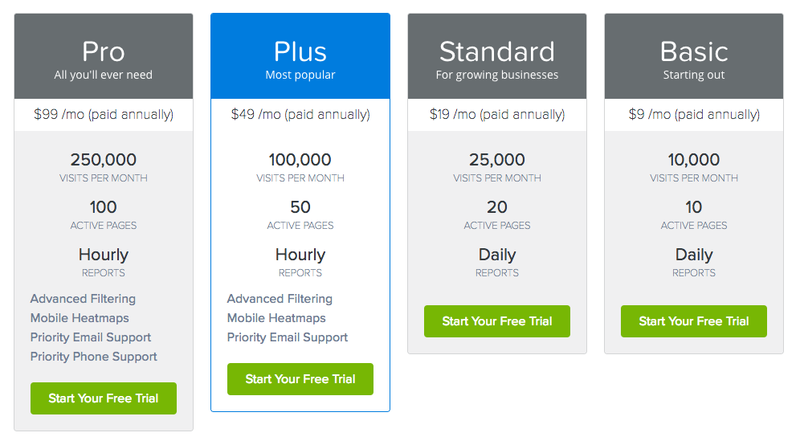 When a user has to pick between the free trial, a standard edition, and the mega-deluxe package, it is clear that slapping an eye-catching badge on a central option reels in extra conversions. Software suites have taken advantage of this tactic for years, removing the paralysis of choice that people tend to get locked into and encouraging a “bandwagon effect” – after all, it is the most popular choice, so it can’t be that bad. In the example above from Crazy Egg, you can see how impactful the highlight and “Most popular” denotation are in action. You can read more about this phenomenon here, along with a few other psychological tricks for increasing the conversion power of your pricing tables. Using the “left digit effect” is a tactic everyone is familiar with. That doesn’t render it any less useful, though; studies have shown time and time again that a product priced at $19.99 will always outperform one priced at $20 flat. As negligible as a single cent is, it holds all the sway in the world when it comes to this pricing strategy. Always follow the 99-cent rule when you are deciding what your customers will pay, and their frugal minds will drive them to spend more than they ever have before. People like to feel as though they are getting something in return for their time invested, and more than that, they want to feel elevated above their peers. Content upgrades are a somewhat recent trend wherein a blog post will feature a link to some form of bonus content. If you want that bonus content, all you have to do is sign up for an email newsletter. Ironically, when the conversion is presented as a minor aside to a meaningful upgrade of some sort, it is much easier to secure – 781% easier, according to this study by Brian Dean. Creating something unique only to keep it behind lock and key may seem counterintuitive, but it could be one of the most effective CRO tactics you ever implement. This may seem obvious, and it is. The effect of light-hearted writing is minor, but few changes are easier to implement. Let your hair down, loosen your tie, and laugh with your visitors, and you can enjoy a 17.9% boost to your CRO. Not every brand needs to be linked to clinical professionalism, and you may even enjoy producing your content more without it. Finally, a well-known tool on Amazon’s belt, and it is a heavy-hitter in promoting sales. High shipping costs and no way around them is one of the chief causes of abandoned shopping carts. Setting a reasonable spending limit that must be passed to do away with those costs dramatically increases the number of sales. This study showed a 90% increase in orders placed, and a 7.23% increase in the average value of these orders, and those are not numbers to leave untapped. Be sure to work a free shipping threshold into your eCommerce website, because our brains are wired for it. The fact is that many customers will happily spend an extra $20 to get out of that $4 shipping and handling fee. 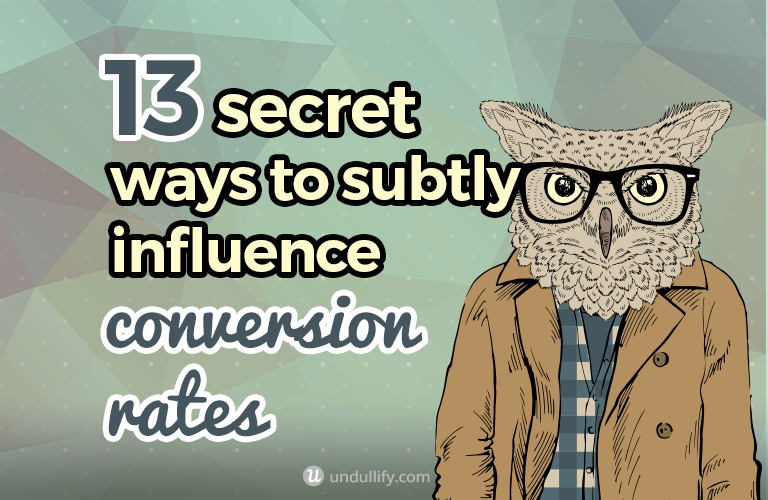 So there you have it: 13 secret strategies to subtly increase conversion rates. Even better, most of these are very quick and easy to implement. Do you have any other tips to share? Speak your mind in the comments below! If you think about it, purchasing a product is an extremely visual activity. If you are in a store, perhaps you pick up the object you are considering and turn it over in your hands. You take in the color, the quality of the visuals on the box or the package. In fact, our purchasing decisions are 93% based on visual appearance alone. 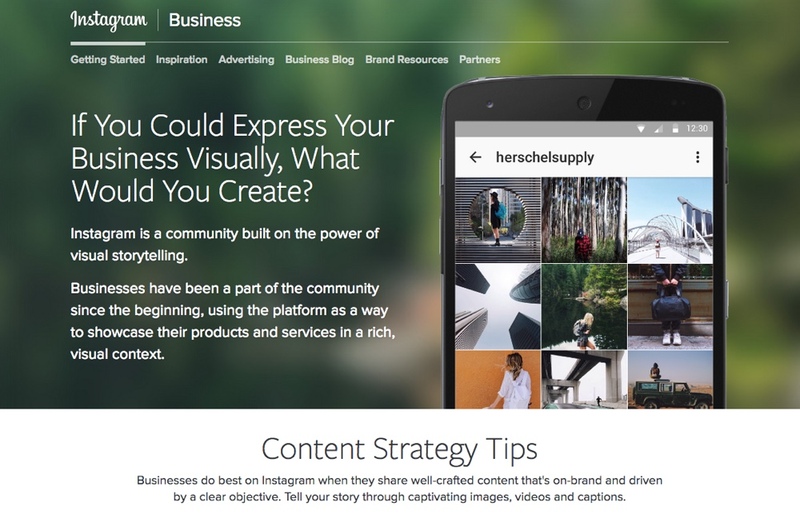 Visuals become even more important online. No longer do you have the ambiance of the store to impact your decision, or the feel of an object in your hands. Now, you simply have your computer screen and the visuals the retailer has chosen to present to you. We can’t touch or experience a product in person – the best we can do is use those visuals to form our impressions of the product. The quality of those images matter, and with little other way to judge the product for ourselves beyond the description and reviews, a lot is hinging on them. 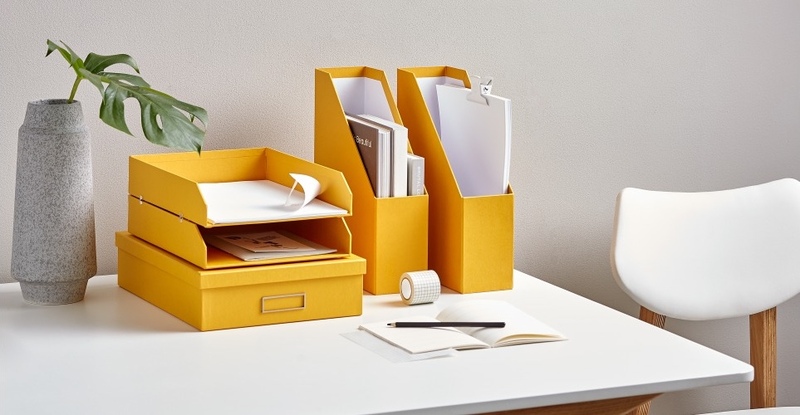 Keep reading to learn how to present your products in the best possible light. 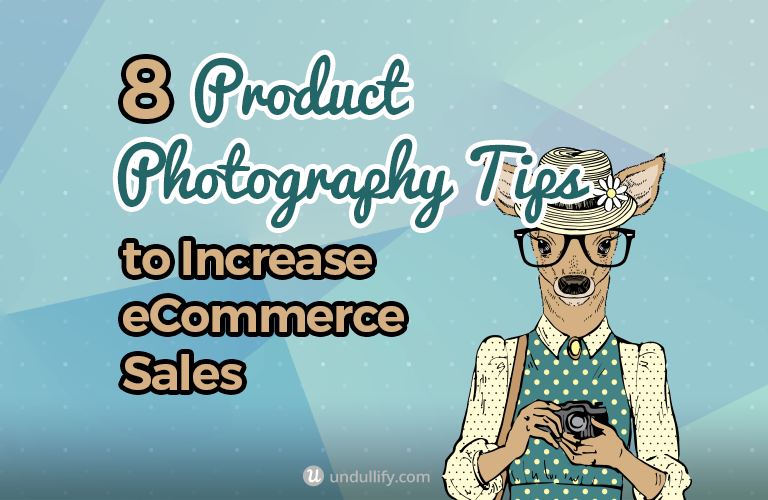 Following these eight photography tips is sure to increase your eCommerce sales. Have you ever considered buying a product online, and then been frustrated to discover that you could not zoom in? I certainly have – what a letdown, when you click “view larger,” only to be presented with an image the exact same size! Perhaps you went through with the sale despite your misgivings, or perhaps it made you stop and second-guess your purchase. The fact is, your customers need large, high-quality images to make purchasing decisions. Not providing something so simple is stunting their decision-making abilities. Why should they purchase from you, when your competitor’s photos are so much clearer? So, get the basics right. Take professional-quality product shots with good lighting and corrected colors. You don’t even need an incredibly expensive camera for this – click here to read my guide to shooting better photos with your iPhone. If possible, design your site with large product imagery in mind. Sure, you can set it up so that your customers can click to zoom, but why not make it that much easier by designing your site so that product photos take center stage? If this is not possible, at the very least offer a high-quality zoom so that your customers can take a closer look. You’ll also want to lightly edit and clean up the raw image so the colors are true to the product, and also shown in the best possible light. Small tweaks such as image crop, color correction, background removal, and image enhancements can all be done inexpensively using an unlimited graphic design service. 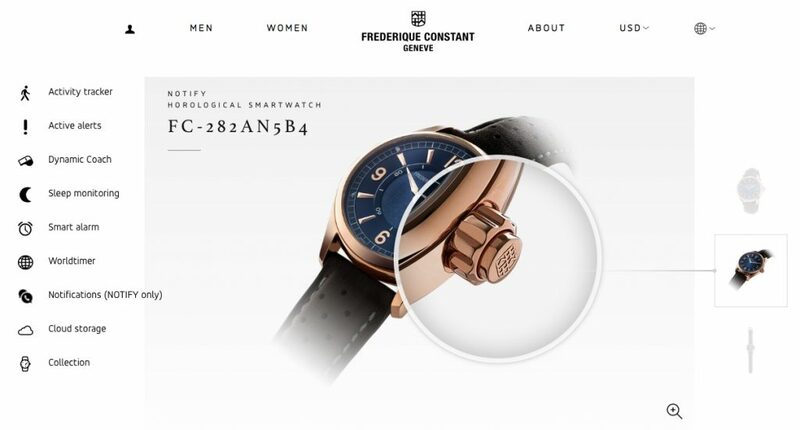 Frederique Constant sells a line of horological smartwatches that demonstrate this especially well. If you’re going to drop $1000 on a watch, you better have a good understanding of the details, right? Not only does their product page design place the watch front and center, but their zoom gives the option of rolling over different parts of the watch to take a closer look. Now for some advice for across your whole product line, not just one product. Pick a default photo angle to use across your entire product catalog, and stick with it. Using a similar “look and feel” not only makes your choices seem more intentional, but it overall lends a feeling of professionalism to your website. Consistency in your product imagery is good for another reason, too. It helps your customers make purchasing decisions from the catalog, because it makes it easier to compare products at a glance. Shooting your products from similar angles makes it that much easier to see which features are present on one model and absent on another. Joybird takes this to an extreme. 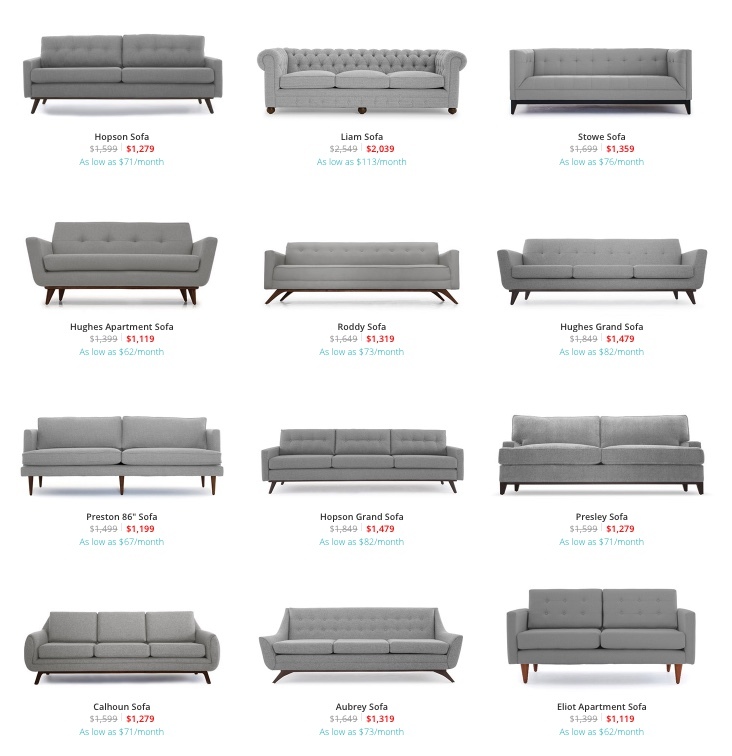 All furniture on their site is shown from the front against a white background in a standard grey color (except for furniture that is only available in leather). Since all their furniture is customizable to the colors of your choice, differing colors in the default photo would distract from subtleties in the design. In real life, your customers can walk all around your product, pick it up, and turn it around in their hands. On the web, they are stuck with the couple of views you present to them – so choose wisely. Use alternate angles to answer the questions your customers might have about your products. Look at similar products to your own on Amazon. Amazon has a feature where customers can ask questions of others who have purchased the product. Through your research, you should discover the most common questions people tend to ask about products like yours. Then, use your product shots to answer them. 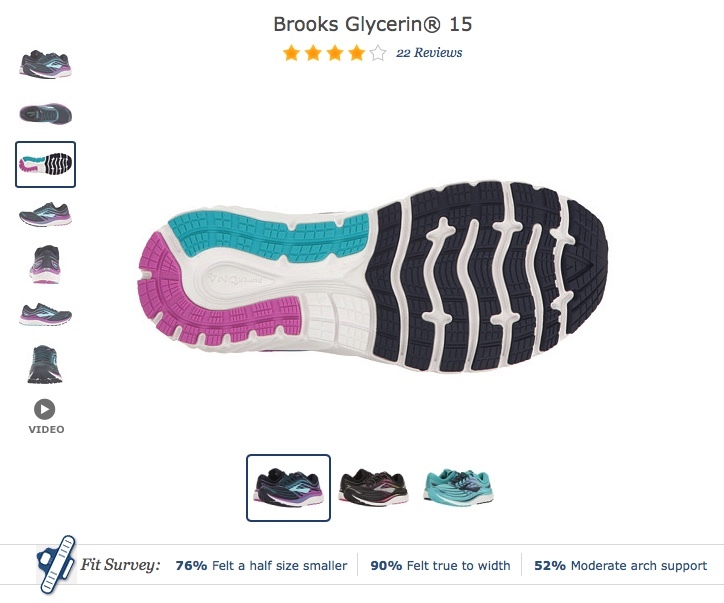 Zappos does this exceptionally well, showing their shoes from all angles: the top, the bottom, both sides, the back, and the front. If that’s not enough for you, they even included a product video, showing a model walking and turning while wearing the shoes. Your customers aren’t just shopping for a product. They are shopping for a better version of themselves. 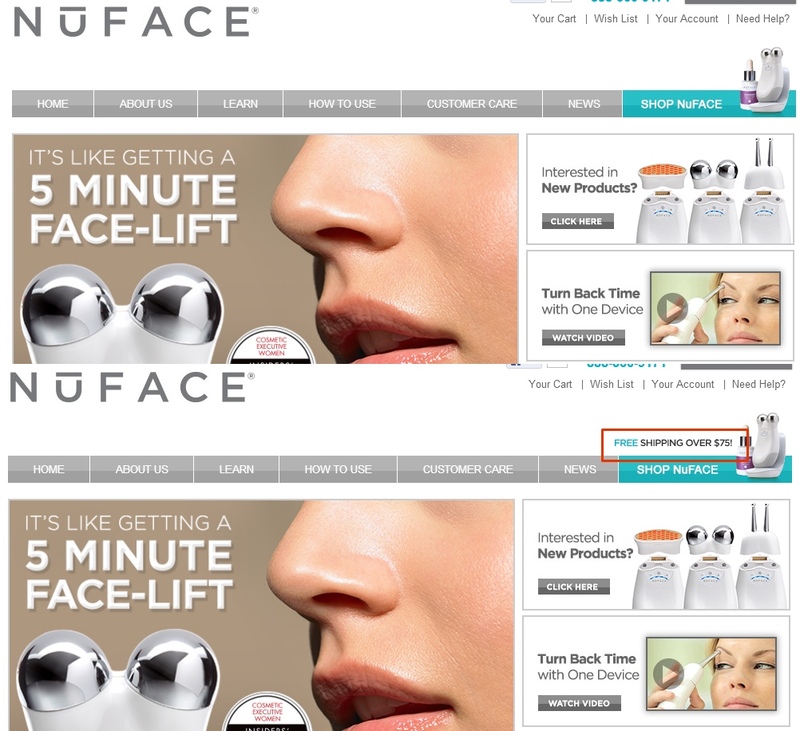 Showing your product in use helps shoppers on your website better envision your product in use. They can more clearly see how it would enrich their own life. This is the same reason IKEA displays their furniture in fully furnished rooms around their stores. In the center of the store, you can see all the different armchairs, sofas, or beds side by side, and go down the line trying them out. But only in the furnished rooms off to the side is it easy to understand what they feel like in context. Also, on a white background it is extremely hard to determine scale. Placing your products in a real environment makes it easier to understand how big they are. I like how Made sets up their product photography on their site. Each product is shown first on a white background (there’s that consistency!) but then in a room in the following shot. Would you have thought to stack the letter trays with the box if it didn’t show them configured that way in the second photo? While it always helps to have a product shot on a white background, as I just covered it makes sense to have shots with more context to them. The props you use say a lot about what you want to convey to your customers about your product. The best example of this I can give you involves a flashback to 2008, when Steve Jobs unveiled the brand new MacBook Air. 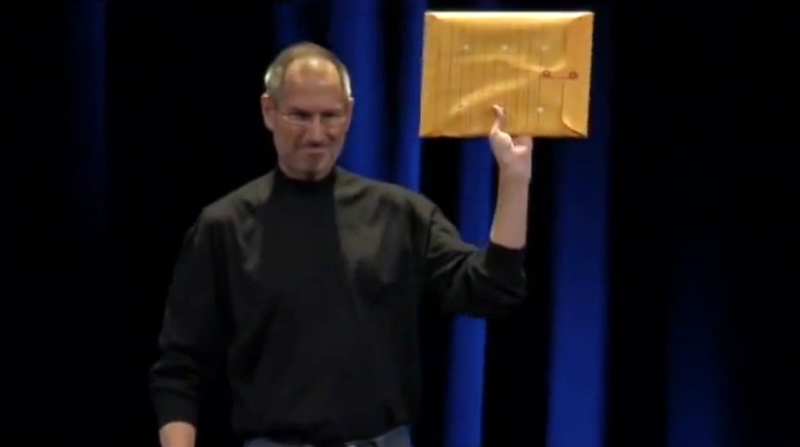 Onstage, Jobs held up an ordinary manila envelope. Then, he unwound the red string and pulled out the world’s thinnest laptop. The prop emphasized what they wanted to say about their product – this laptop is very thin. Handmade protein bar producer Kutoa surrounds their products in the ingredients they use for their product shots. 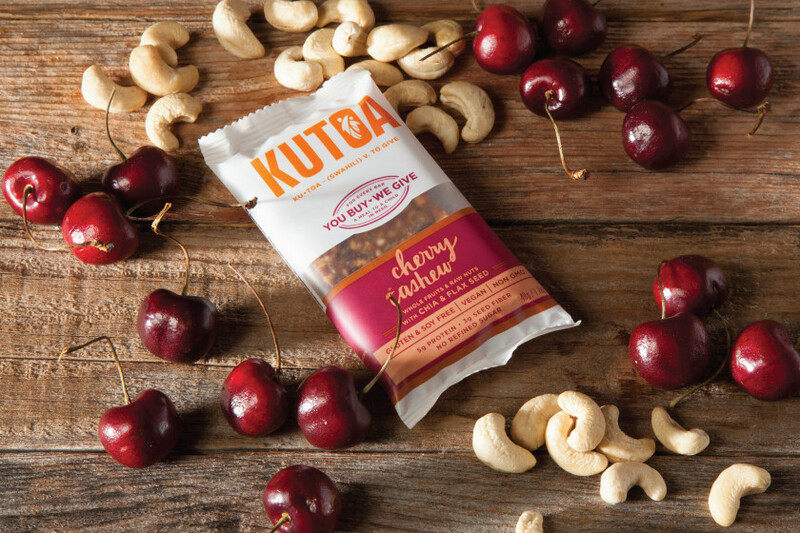 Not only do these photos convey the realness of the product, but they put a taste in your mouth by showing you chewy cashews and juicy cherries, much more than a close up shot of the lumpy bar ever would. Well, the people that use your product, of course! Not only does seeing your product in use by other people give a better idea of what it’s like to experience your product, but it can actually raise your conversion rate. In fact, in one case study, 37Signals found that including an image of a smiling customer on their landing page resulted in a 102.5% increase in conversions. Including a person on their product page more than doubled their conversions. You can also use the people in your photographs to direct your customers’ eyes. 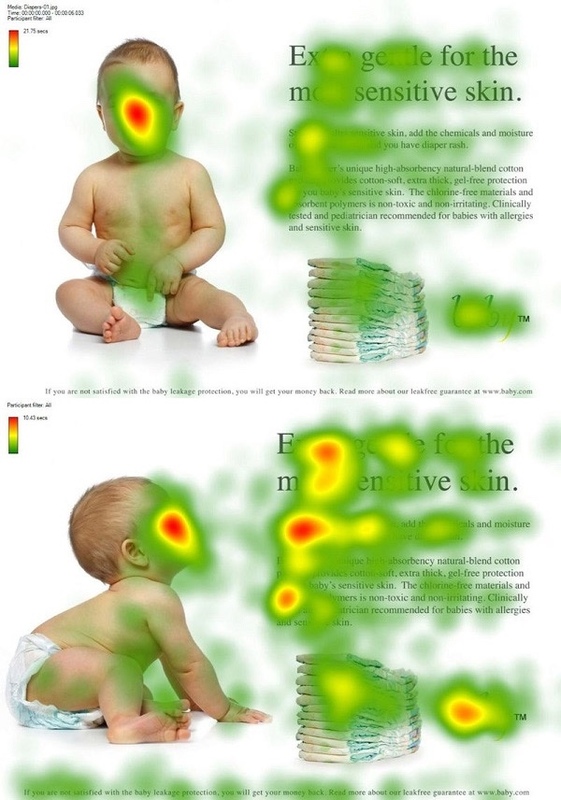 Eye-tracking studies have shown that we follow the portrayed person’s gaze. For example, if the person is looking out at us, we meet their gaze, and find our eyes drawn to the same spot: their eyes. If, however, the subject is looking elsewhere – perhaps at your CTA – our eyes follow the path of that gaze and read the CTA. 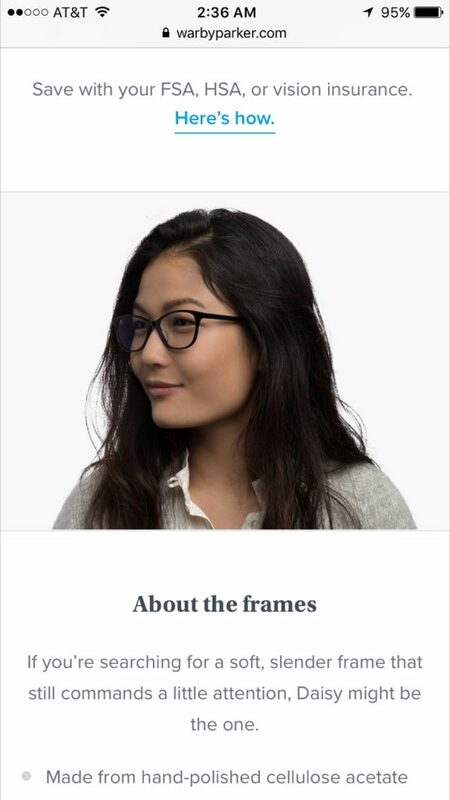 Lens replacement vendor Lensabl has a large video on their homepage showing different customers with their glasses. These customers make silly faces, wink, blink, wiggle their frames, and raise their eyebrows – generally looking straight ahead (which, incidentally, keeps your gaze right on their product), but sometimes looking toward the CTA. Mobile shopping, or mCommerce, is a growing trend. In 2015, 41% of time spent shopping online was from mobile devices, and some estimates forecast that by the end of this year, mobile will overtake desktop for the share of time spent shopping. If you’ve ever tried shopping from your phone – and chances are, you have, since 62% of us have – you’ll know that it is a frustrating experience. Products are difficult to see; websites are poorly optimized and require a lot of pinching to zoom; and in one particularly frustrating instance I had to zoom out and zoom in every time I switched to the next field of a form. Because mobile shopping is so difficult, it can lead to a lot of cart abandonment. So rarely is mobile shopping actually an easy, frustration-free experience. One time I was pleasantly surprised, though, was with Warby Parker. When I bought my glasses there, I did a lot of research, looking around their site to pick the perfect frames. I was delighted to find that their product images, which I’ve showcased before for having a cool rollover effect where the model’s head follows your mouse, actually have an even better experience on mobile. Turn your phone slightly to the left and right, and the model’s head turns in the same direction. Sometimes, nothing will describe your product better than a little bit of motion. One example is fidget spinners – often sold in super generic packaging, you would have no idea what the point is until you see one in motion. Animated gifs are perfect for occasions like these. Even better if they play on the product category page itself. Click here for an example from Colossal. 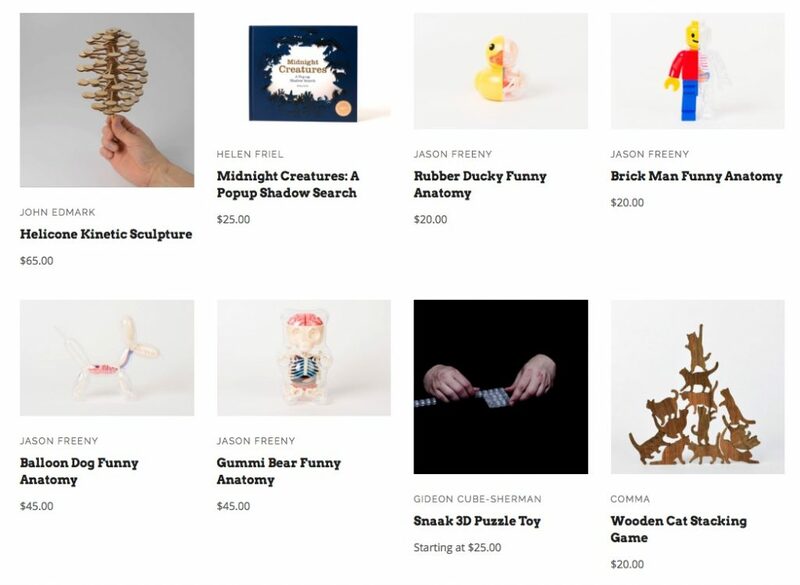 You can’t see it in my screenshot, but both the kinetic sculpture and the 3D puzzle toy have animated product shots that jump out at you just from the archive page. Here’s the animated gif itself – I want one just from the image! Online, your customers can’t experience your products for themselves. All they can experience are the visuals you provide for them, so choose wisely. Start with large, zoomable photographs that are professional quality and well lit. Use consistent product shots across your entire product catalog to make it easy to compare products at a glance. Answer your potential customers’ questions with product shots from a variety of angles. Show your products in use to make it easier for your customers to imagine using them. 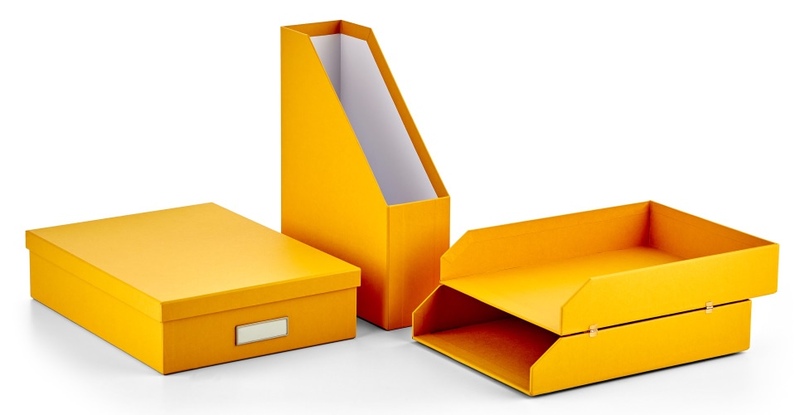 Emphasize your products’ quality with carefully selected props. 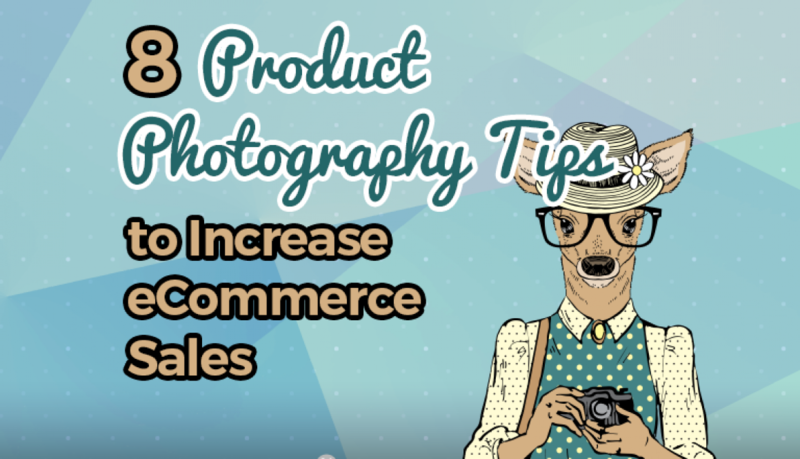 Include people in your product images and use their gaze to draw your customers’ eyes. Create a delightful, not frustrating, mobile experience. Show your product in motion to give instant understanding of the value of your product. So, you’ve got a blog – everybody says your business should have a blog, so you made one. And maybe you regularly write articles relevant to your industry or the customers you hope to attract. Chances are, if you’ve been doing this for a while, you have a large number of articles that relate to the core theme of your business. If you’ve created a number of articles around the core theme of your business, and don’t have a sort of “gateway” to guide your visitors to the specific content they are looking for, what you need is a cornerstone article. 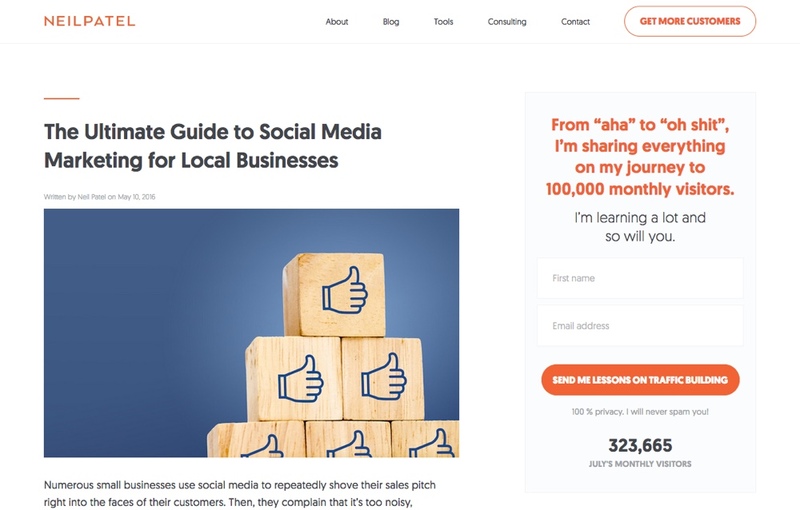 Cornerstone content is epic, over-arching introductory material about a core theme of your business that can act as a gateway to other articles on the same topic. Consider it a sort of “resource center” to that topic. 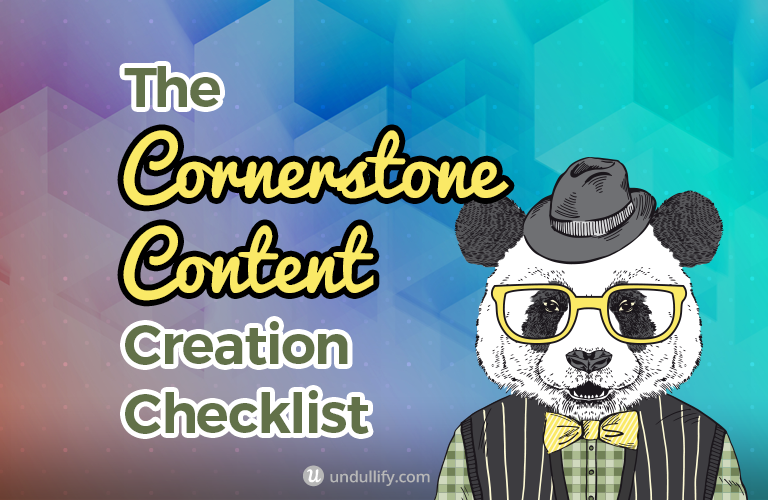 When you create cornerstone content, your goal is to be the ultimate source on that particular topic. Easy: just follow the simple steps laid out in this article! Then check out the checklist at the end for a concise set of steps to follow. Wait! Before you start from scratch, it is a good idea to consider if you already have an existing article on your site that you could “elevate” to cornerstone content status. Consider your highest value posts – is one of them broad enough in scope to become a guide to the other articles on your blog about that topic, with some edits and additions? You don’t want to create multiple pieces of content that compete for the same set of keywords, so this is always the first place you want to look. It is essential to perform keyword research before you create your cornerstone content. Even if you don’t do keyword research normally, now is not the time to skimp out. Since cornerstone content is so valuable, central, and high-level, it is often your best shot at ranking for your most competitive terms. These terms are called “head terms” and are typically 1-3 word phrases. 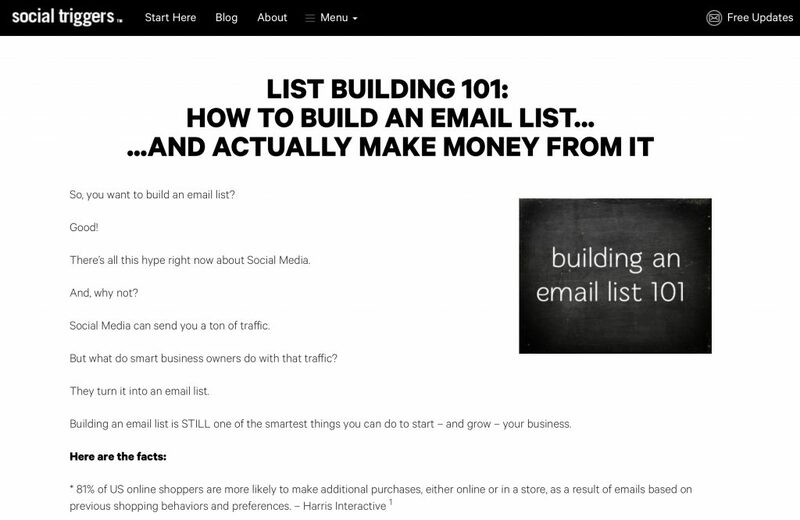 For example, Derek Halpern from the blog Social Triggers created this in-depth piece of cornerstone content, pulling together related articles and videos, all about list building. His target keyword? “List building” – and the page is so well-optimized that it is currently ranking #1 on Google for this competitive term. Then, the pages that fall underneath your cornerstone article should target more “long tail” terms, digging deeper into the subject with more targeted content. Never target the same keywords with the pages underneath your cornerstone article, and for the article itself. If you do, the pages might compete for rankings and neither would do as well as one really optimized page. 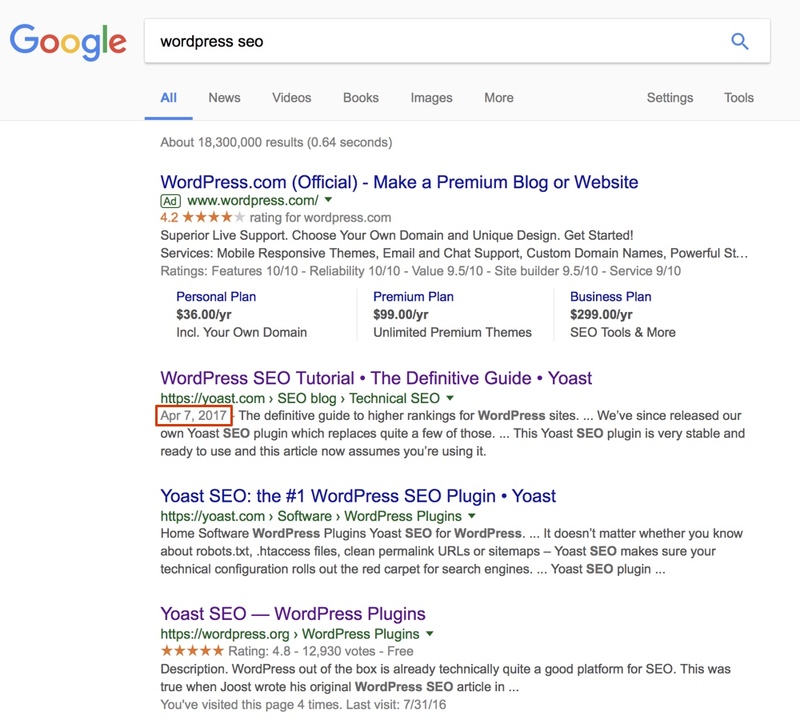 You can use a plugin like Yoast SEO to help you optimize your content and to make sure you only target any particular keyword phrase one time. 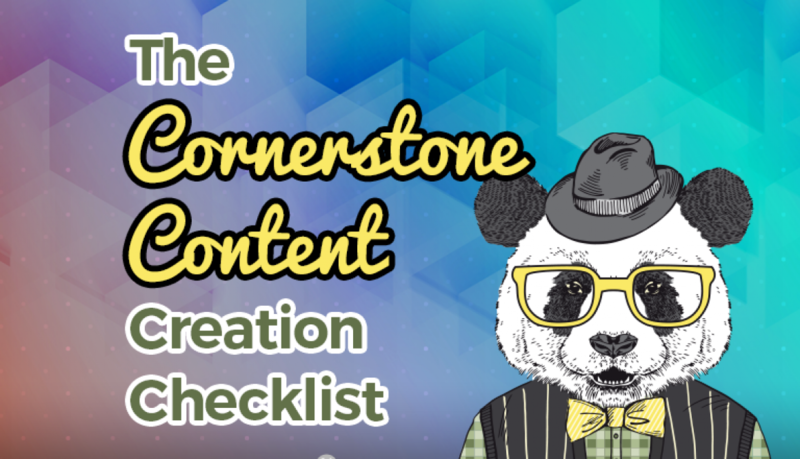 Yoast recommends creating your cornerstone content as “pages” instead of “posts” in WordPress. This is because pages are meant to be more static, permanent parts of your website. Posts, meanwhile, fit into a chronology that can make them feel less and less relevant to your visitors as that timestamp gets more and more distant. If you are upgrading an existing article into a cornerstone article, you may have already created it as a post. That’s okay! You can use a free plugin like Post Type Switcher to convert any post to a page. Cornerstone articles, as we’ve already discussed, act as a gateway to the rest of your related content. Seeing as this is the case, they should feature prominently in your navigation and throughout your website. Be sure to link every other post about the topic back to the cornerstone article, as this indicates to search engine crawlers the importance of that page within your site. You can also link to it every time you touch upon that topic from other articles or pages around your site. 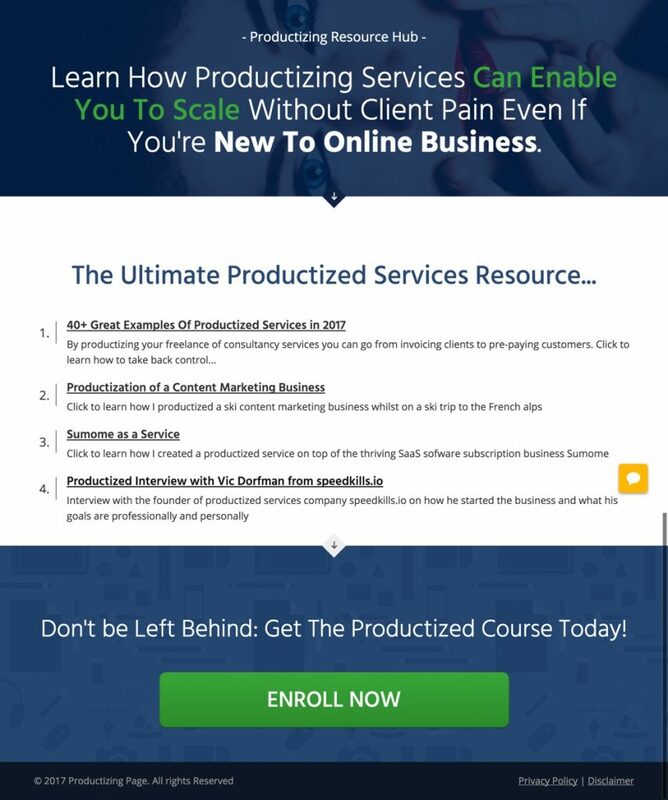 As an example, this page serves as a hub for the rest of Richard Patey’s articles about productized services. It guides the visitor through four articles to better explain this concept, and then directs the visitor to the large “enroll now” call-to-action. According to an article about cornerstone content by Yoast, “cornerstone articles are usually rather long. You want your gateway article to be broad enough to be able to reference and link to every other article on your site about that topic. You also want to be able to add in links to other related pieces in the future. It is true that cornerstone content does not always have to be lengthy. Sometimes it is more of a landing page tying together related content and pushing the visitor towards a CTA, like an eBook download or subscription. However, longer content is likely to be more successful, especially if your website is newer or hasn’t built up a lot of authority in your industry. This is just because longer content ranks better than shorter content. Cornerstone articles are the ideal location for a highly-targeted CTA. If you have an eBook that expands on a topic even further or even one that simply pulls together your best articles around the topic into a well-designed and downloadable format, this is the ideal place to offer it in exchange for an email address. 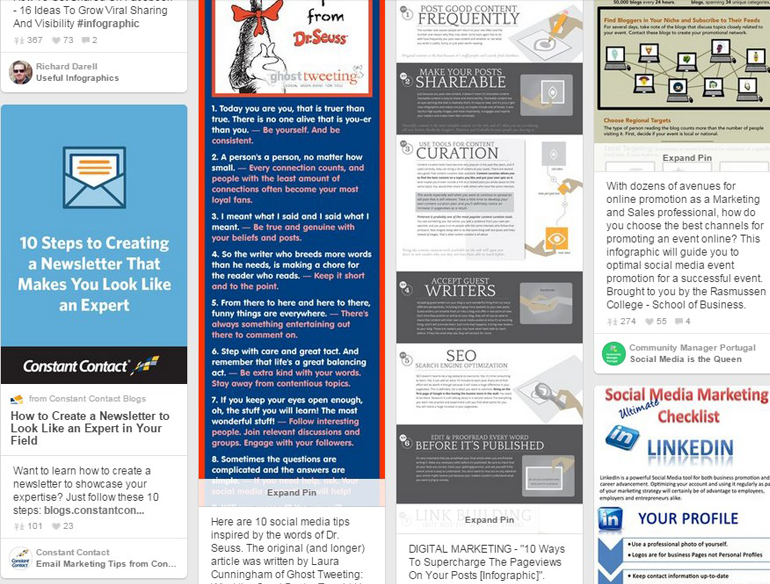 For example, Copyblogger’s landing page for their eBook How to Write Magnetic Headlines serves as a gateway to other articles on their blog about writing headlines and generates signups to their service in exchange for being able to download. They often link to this page when they mention headline writing, funneling interested readers to their eBook. As we’ve mentioned before, focus on width in your cornerstone content rather than depth. Each section should act as an introduction to an idea that you expand upon in the linked articles. If you find yourself covering something that you don’t have a relevant piece to link to on your blog for more information, that might be a sign of a blog post you should create. There are lots of paid and free plugins to make this easy. The key is to make these as visible as possible without being intrusive. Consider placing the share buttons as a ‘sticky’ side, top, bottom, or floating bar depending on your site’s design. The truth is, writing phenomenal content alone is not enough. Your audience is lazy and will most likely skim your content rather than reading it word for word. 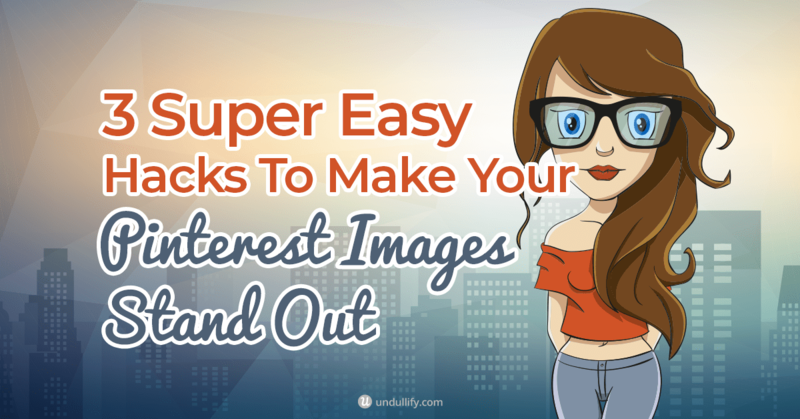 Make it easy for them to read and digest by breaking up your content with images. But don’t stop there. Take it a step further and make it impossible for them to not sure the content by creating engaging, relevant images. After all, a study found high quality images were the most important tactic for optimizing content for social media. You can use free stock photos and images, or have your own custom images and graphics created by hiring a professional designer from an unlimited graphics design service. Hashtags make it easy to track trending topics, categorize social media posts and make it easier for users to find related content. They can also help increase the visibility of your content and boost your social shares. While the use of hashtags may seem rather random, there’s a strategy involved in getting the most out of them so make sure you do your research before you add them in. Your cornerstone content shouldn’t remain static as you continue to publish new content on your blog. How can it be the gateway to all your relevant content if you don’t keep it up to date with all the newer articles you publish around that theme? Schedule regular revisions to keep the cornerstone article up to date. It is a good idea to schedule a recurring calendar reminder every three to six months. Of course, make your reminder more often if you are in a highly competitive industry or if you are producing a ton of related content. I recommend installing a plugin like Last Modified Timestamp to show your readers that you are continuously updating the post. The timestamp is sometimes displayed in Google search results, which can make your article more enticing – especially if it is surrounded by other, less up-to-date articles about the same thing. Yoast is the undeniable king of this strategy – and I’m sure they are very aware of its effectiveness! 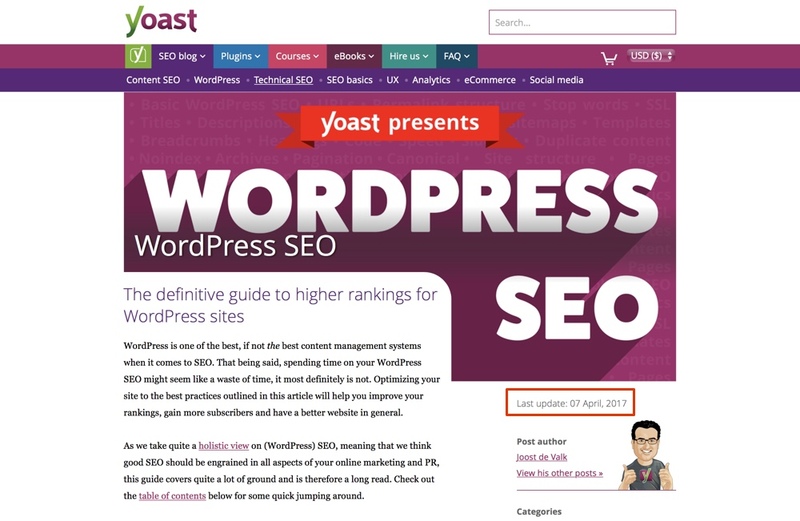 I feel like every time I visit a Yoast article, it has been revised within the last couple of months, even one as old and extensive as their “definitive guide” to WordPress SEO. There you have it – eight important steps to help you achieve content marketing greatness! Follow these simple steps to create a cornerstone article that will tie all your best articles together. You are sure to see improved rankings as a result. Consider upgrading an existing post. Target your most competitive keywords. Create your cornerstone article as a page. Place the cornerstone article high in your site’s hierarchy. Build in a strong CTA. We all want to stay trendy and relevant, and the web is the place to do it. Any brand or business will benefit from keeping up with the times, and getting on board with trending topics while they are still developing is a great way to gain exposure and ensure a place in the ongoing conversation. Getting the timing right can be a challenge, however, as content destined to go viral is tough to discover before it does so. Waiting too long, on the other hand, makes your content just another bandwagon post if it already has. Making a splash on the internet is often a matter of luck, but persistence and an eye for opportunity can help get you there. Just paying attention will only take you so far, so in this post we will cover seven platforms that enable you to tap into the ebb and flow of a digital audience’s attention as easily as possible. The number one culprit for our dropping workplace productivity might be a good place to start being productive, in this case. 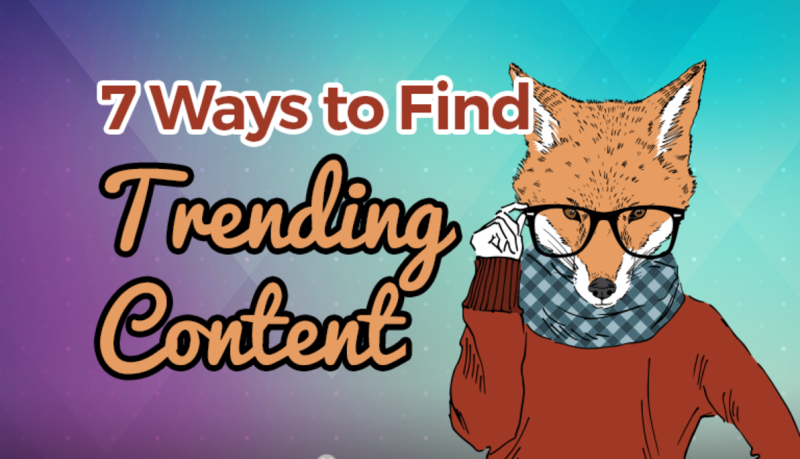 A ton of trending content makes its debut on one of Reddit’s countless communities. These communities, called “subreddits,” target specific hobbies, topics, or disciplines. They are an excellent pulse check of what is hot with this particular group, right now. 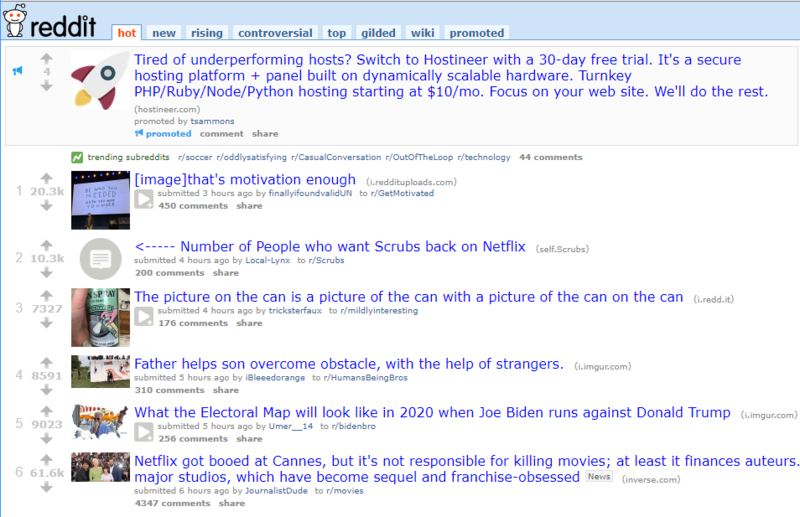 Each subreddit also features filters at the top of the page that enable you to view recent, top, hot, or controversial posts – and almost every post comes with comments, a timestamp, and sources to investigate. If the best-performing hiking posts all get started on a specific outdoorsman’s blog, a sporting goods manufacturer has just discovered a direct line to what their customers care about. 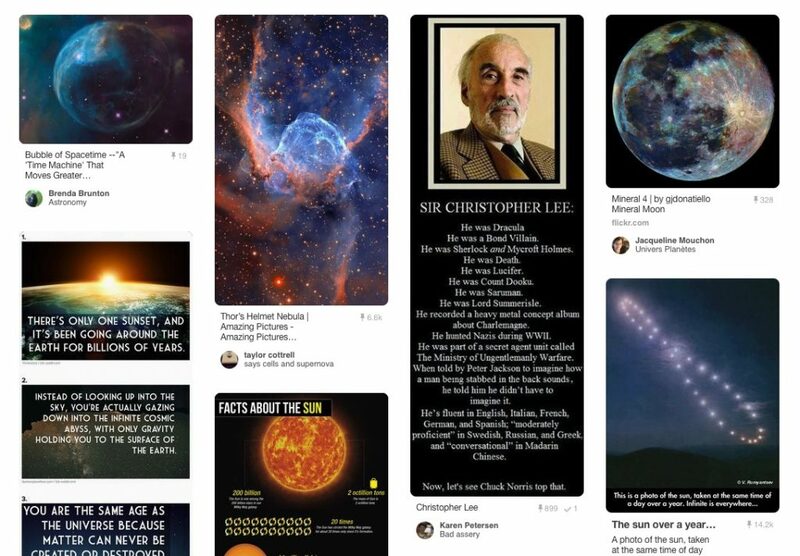 Pinterest is a more visual alternative to Reddit, with images taking up the majority of the screen’s real estate. A favorite of creative types everywhere, Pinterest has risen to become the largest social image sharing website, and is where many bloggers are able to rise from obscurity for the first time. A recent development, Pinterest’s “Explore” section was launched right at the end of 2016. This new service offers filters to help you spot pins that are starting to gain momentum, and you can even choose specific categories to search through. Every New Year’s Day, posts abound that deal with resolutions and 30-day challenges. This could easily be an opportunity to create a challenge of your own and have it make the rounds, doubling as a tool to inspire potential customers. 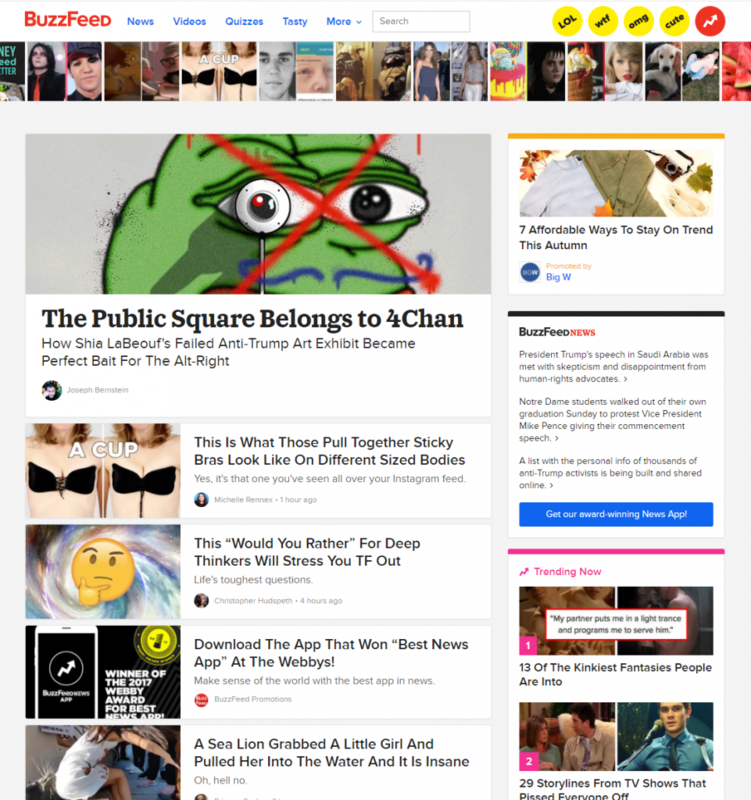 BuzzFeed may have a bit of a stigma attached to it as a place where reposts are the order of the day, but there is no denying that it helps serve niche content to a much broader audience. This exposure from their posts almost always leads to a surge in social media attention, and a quick enough person could easily mooch off the inevitable rise in related search traffic. 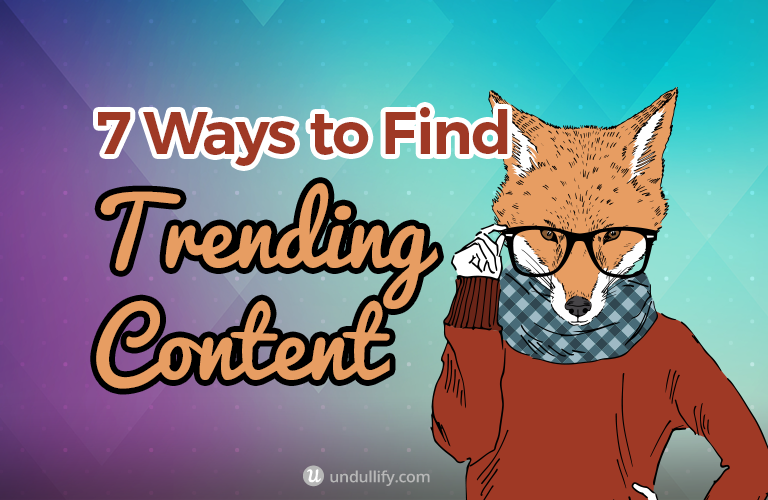 BuzzFeed writers do their homework, after all – they find trending content for a living! Where will people wind up when they are curious and want to read more about a recent trend? Google is a safe bet, as the most popular search engine in the world. Thankfully Google offers a variety of tools to help us track their users’ interest in any topic. 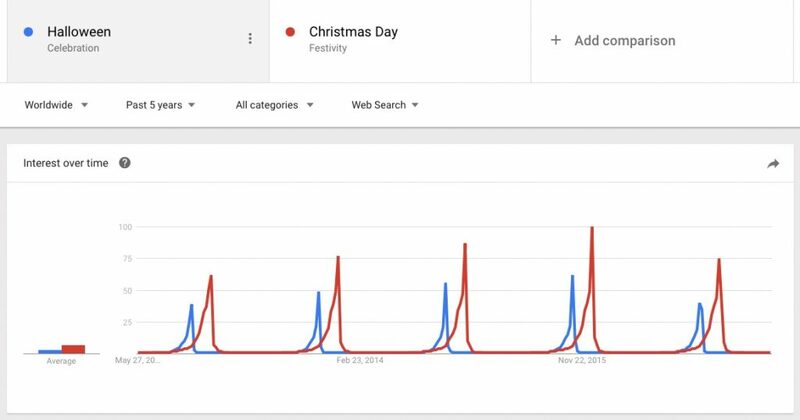 Google Trends allows you to follow the search history of keywords, compare related keywords to get a feel for how searches are carried out, and view all of this information as a convenient set of line graphs. This is great for forecasting seasonal trends. Notice an uptick in Halloween searches in September? You can be one of the first in your niche to put Halloween content out for your followers to discover. 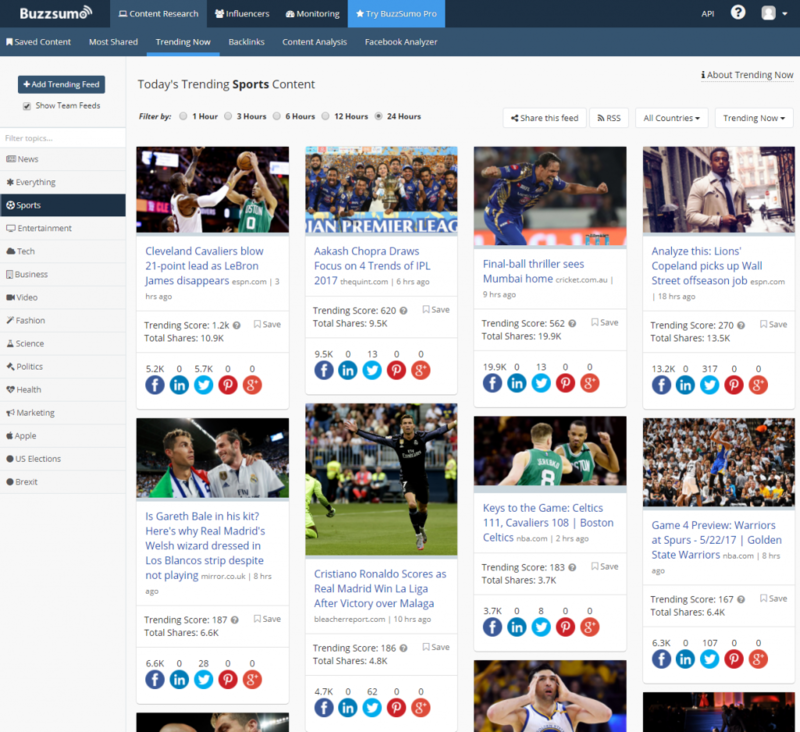 Buzzsumo takes some of the grunt work out of hunting down trending topics, and is a powerful tool for the savvy content creator. The previous 24 hours of big hits all over the internet can be analyzed for free and mined for potential content under the Today’s Trending Content section. Where this site really shines, however, is in its paid services. All of the most-shared content around a given topic – or from a specific domain – can be filtered through and monitored for any developments worth taking advantage of. Additional information on who is sharing, how many links the content has earned, and the content’s success across the full spectrum of major social media platforms is also available to be picked through. If you are browsing popular posts and see health and wellness products like your own performing particularly well on Facebook, you can adjust your advertising accordingly to favor that platform. Buzzsumo Pro is easily an investment that could pay for itself in time, as for every ounce of hard work put in a pound of effort is saved. If you are following a large number of blogs, news sites, and YouTube channels, it may help to have an organized means of sifting through the bulk of what is posted. Feedly is a longstanding favorite for RSS feed aggregation. From the in-browser app interface, you can designate categories for sorting your feeds, and read through them at will. You can also set alerts to go off when certain keywords are mentioned, search across feeds for specific terms, or discover related content producers based on what you have already followed. There is no clearer sign that a topic is starting to trend than numerous blogs all covering it within hours of one another. Knowledge is power, and Feedly is the perfect way to keep the knowledge from becoming too messy. Riding the waves of trending content on the web is an art form, and some people just do it better than us. Some websites are devoted to discovering trends at the source and broadcasting them to the world. Some of these websites are free, but if you are looking for the big guns you might need to shell out a little dough. Two popular services are Trend Watching and Trend Hunter, each of which have active, free communities of businesses and individuals working to keep each other on the cutting edge of trending topics. Beyond that, both function primarily as paid professional tools for trend forecasting, and cater to some of the world’s largest companies among their clientele. In particular, Trend Watching specializes in analyzing the market and developing strategies for its paid members. Many of the most tantalizing features may seem prohibitively expensive, but these are services that cater to businesses at the cutting edge, and there is no doubting their influence and credibility in the dynamic online environment. All of the tools mentioned above are just starting points – the greatest payoff will always come from researching your specific industry and finding the curators who cater specifically to your audience. A healthy amount of success can be had just by observing the ever-changing darlings of the Internet. This is not to say that you should always be a follower, though. Sometimes forging ahead on your own leads to greater success, and becoming the epicenter for a new hot topic or product can help establish your brand as a mainstay. Too much regurgitated material lends itself to looking dull and lifeless. Without any unique personality to your brand, the eyes you have worked so hard to attract can just as quickly depart for the next viral post. Trends come and go. Being aware of the design trends that are currently gaining popularity can make your brand look more modern and with the times. While redesigning your website around a current trend may not be the wisest choice – especially if the trend is here today and gone tomorrow – there are still a lot of ways to tap into current design trends. Social media graphics and blog post featured images are a great way to tap into current styles in a more temporary way than a website design. So how do we learn what trends are on the up and up? Of course, we can simply observe what trends we are seeing more and more, but we are biased by the sites we choose to frequent. By observation alone, you are also more likely to only catch wind of certain trends when they are at their peak, at which point it may be too late to use them to their greatest potential. 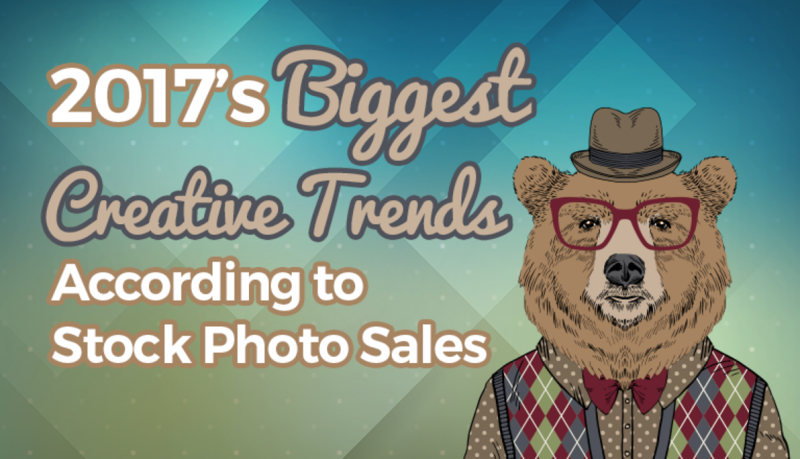 One way to find the trends as they are gaining momentum that works surprisingly well, however, is to take a look at trends in stock photo sales. From this more impartial data we can see commonalities between the base elements that designers are bringing to the table, and draw conclusions about how trends will catch on. 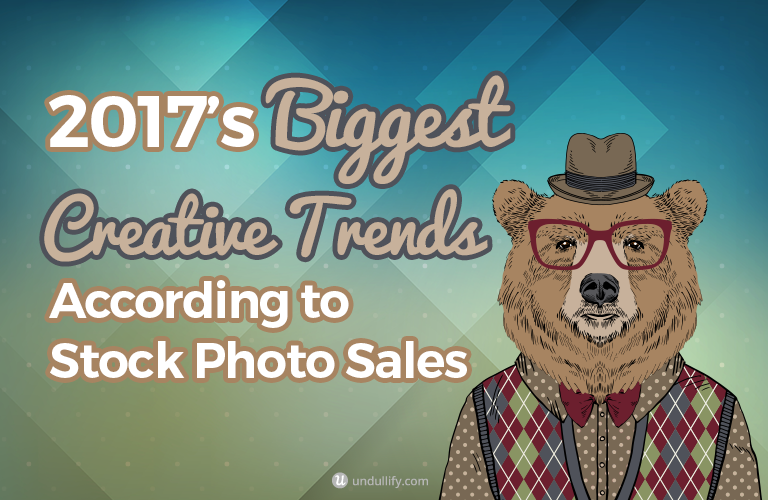 Each year, Shutterstock releases its annual Creative Trends Report compiling data about stock photography purchases. 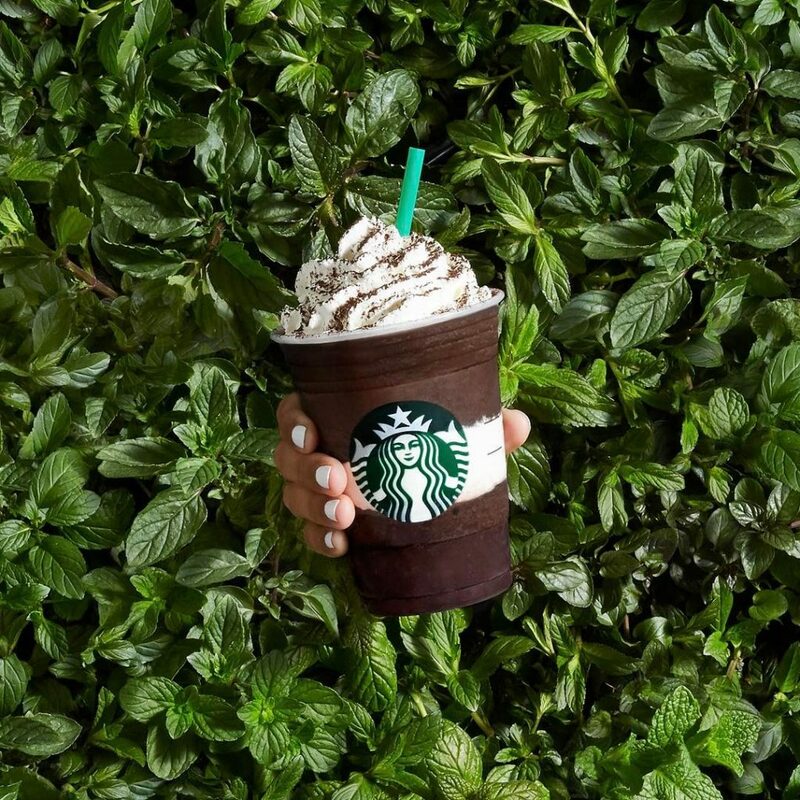 Let’s take a look at some of their findings for 2017 and how they have translated to real-world creative trends in brands’ Instagram posts. The 90s may be dead and gone, but that doesn’t mean we’ve lost that wistful nostalgia for days gone by. Crazy patterns and bold neon prints are alive and well, and making a splash in our Facebook and Instagram feeds. According to Shutterstock, nostalgia imagery is up in sales by 213% over last year. 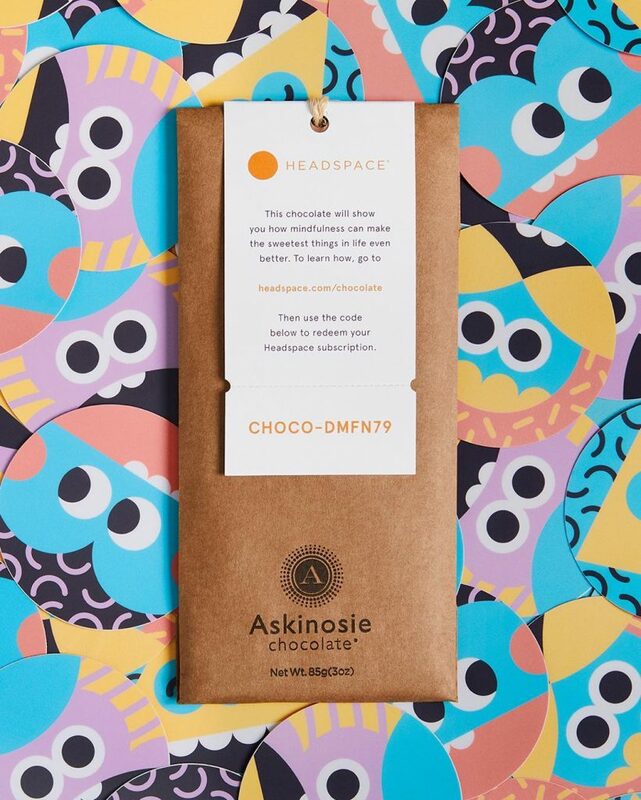 Headspace is a meditation app popular amongst the same twenty-somethings who are nostalgic for simpler times. In this image, they use a crazy background pattern made up of a variety of simple shapes tossed together to draw attention to a limited time offer. It worked, earning the app over 400 likes on this image alone. Flat lays have already been popular with lifestyle bloggers for some time, but maybe this is the year we start seeing them in mainstream media. Shutterstock highlights this trend as being on the rise particularly where video is concerned. Who doesn’t love a beautiful flat lay? 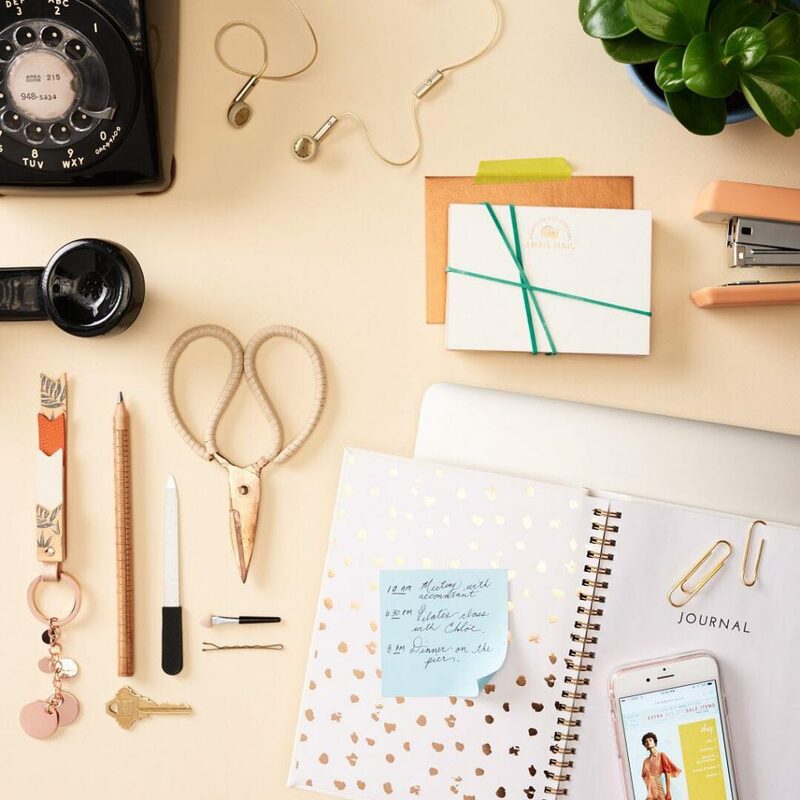 Anthropologie shared this image back in January alongside a blog post about tidying your workspace. Some of the items shown are pieces from their desk collection, which is good news, since it earned over 14,000 likes. Top down views – both still images and videos – are perfect for showcasing products and collections. According to Shutterstock, organic textures are having their day right now, up by 74% from last year. These are the patterns found in nature, such as marble swirls and tree rings. The Plant Society is a business all about organic texture – after all, they sell plants. 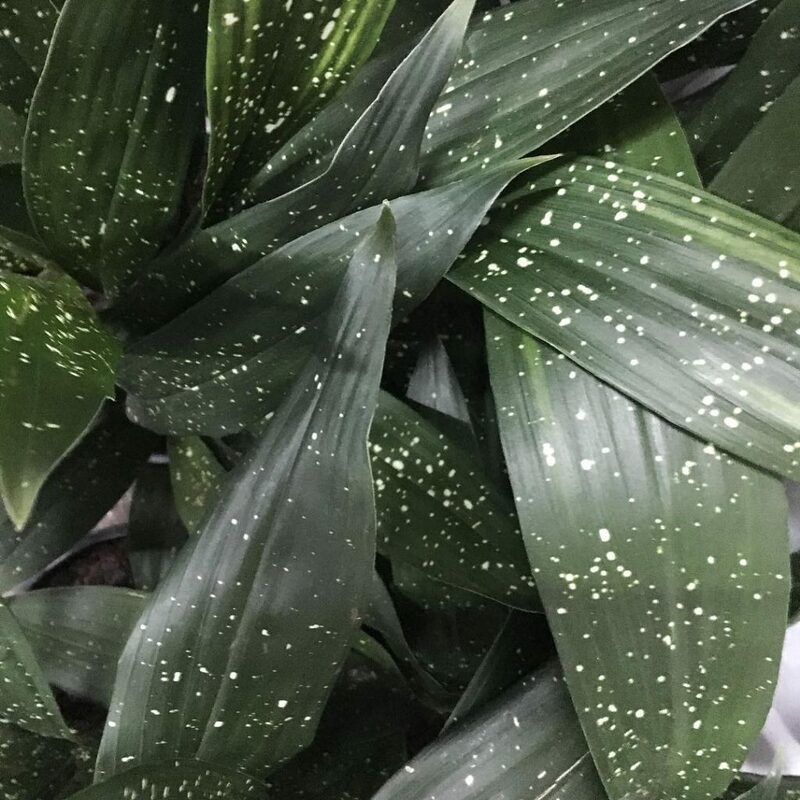 I love this speckled pattern from an Aspidistra Shooting Star. Maybe it’s just riding the heels of the first hints at summer weather, but tropical imagery has definitely been more and more on the radar. Shutterstock describes it as “a feel-good trend inspired by vivid colors, lush vegetation, and exotic fruits.” Overall, according to the service, sales of tropical-themed stock imagery are up by 44%. 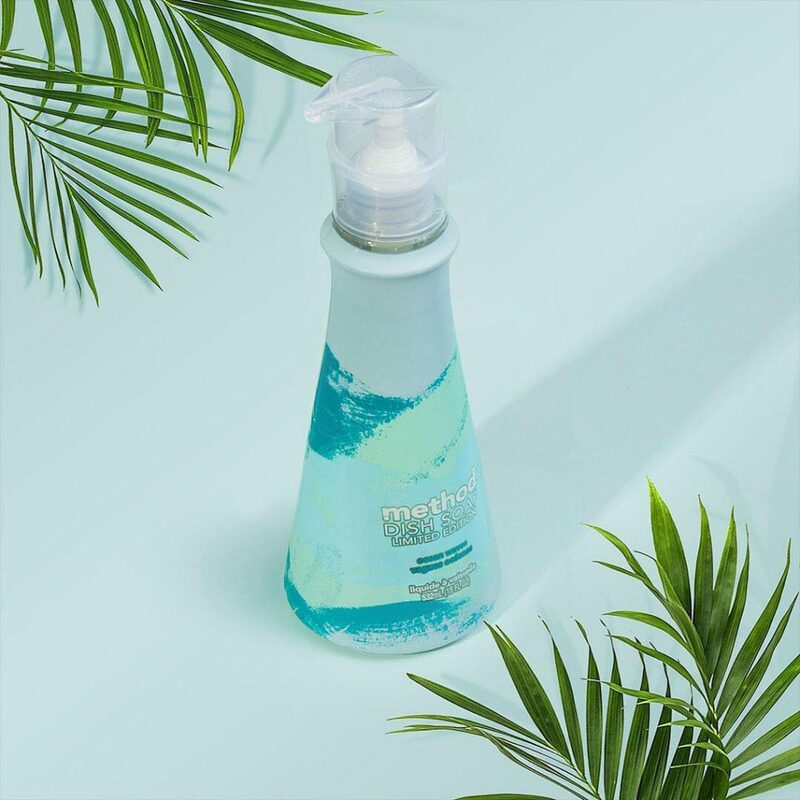 I’m loving this shot by Method promoting a tropical dish soap, with pretty palm fronds in the corners. It earned nearly 300 likes from their followers. It’s the perfect relaxing, jewel-toned palette to get you imagining ocean breezes – exactly the sort of associations they want you to have with their soap. In addition to tracking stock photo sales in different categories, Shutterstock also tracks what images see the most popularity on their social accounts. Muted color palettes were the foremost social trend by their measure. If you look, you’ll see this trend almost everywhere on Instagram right now, but I wanted to highlight this customer image Airbnb re-shared to their followers. It’s the exact sort of serenity many of their customers hope to find on vacation, and earned 21,500 likes. Another social trend that ranked highly was Reflection. This trend also ranked in the report for sales, increasing by 140% over last year. But what is “reflection,” when it comes to stock photos? It means taking the time to “contemplate and appreciate the moment,” whether that is through meditation or just stopping to smell the roses. This image shared by the Ritz-Carlton Hotel is actually another re-share from a customer. It pays to have artistically talented customers! The image earned over 2,400 likes. From nostalgic neon patterns to stoic self-reflection, the Shutterstock Creative Trend Report paints a picture for us of what trends are on their way up, and what is absent tells us what is on its way out. I saw no signs of last year’s watercolor textures or glimmering metallics. How you choose to use these trends is up to you. Using them in your social media branding, blog post images, and social images is a great way to briefly indulge in a trend without committing to it, like you do a website re-design. Doing so will make your imagery more appealing to your audience – these things are trends for a reason, after all – and make your brand feel more aligned with the times. Last year was a huge year for rebranding. Some of the most well-known former tech startups and other big brands unveiled brand new logos. Some of the redesigns were met with universal praise… and some were met with controversy or outright derision. This post will cover 10 recent logo or icon redesigns. Love them or hate them, they can teach us a thing or two about the landscape for branding design trends in 2017. Technically, Google’s rebranding happened in late 2015, but it paved the way for a year of flattened and modernized tech logos. With their logo redesign, they finally bid adieu to a serif logo that had graced the most visited site on the internet for a full sixteen years, since 1999. While the logo had been updated several times during that span, to make the emboss a little subtler, this was the first major update. There is nothing risky here. It is almost a given that a tech company looking to modernize would update their serif logo to sans-serif font, and flat design has been almost the default design aesthetic since Apple ushered it in in 2013. Still, it was a signal of sorts that flat design is here to stay – after all, Google is willing to pin their logo on it. This move triggered a number of other brands to move away from skeuomorphic design. In one of the most-discussed redesigns of 2016, Instagram finally replaced their skeuomorphic camera icon with a more modern and minimalist gradient icon. The white-on-gradient look corresponds nicely with Instagram’s companion apps, which include gradient-colored linework over a white background. As can be expected for a branding change of an app used by so many people, the reaction was immediate and immense. Many simply lamented the loss of their familiar, if outdated, logo. Others noted the genericness of the gradient color scheme. Some just complained about the line image inside the logo, that looks about as much like a camera as it does a front-loading washing machine. Still, the vibrant logo is an indicator of the continued neonization of logos, and a signal that we’ve only got more colorful logos coming our way in 2017. While both Google and Instagram’s logo redesigns were varying attempts at modernization, MasterCard’s was an attempt at becoming more digitally accessible. The original rendition of MasterCard’s overlapping circle logo was introduced in 1968 and included three colors. Starting in 1990, the logo was brightened and the center color of the overlapping circles was scrapped for the interlocking lines we are familiar with. There is no need to save ink on the internet, so the new design brings back the third color, returning the original vision for the Venn diagram logo. The new design also separates the wordmark from the logo, so that it is easier to read when shrunk to fit a phone or tablet. Now that these are separated, it allows the overlapping circle design to be more iconic. In fact, 2016 saw a number of logo redesigns that moved towards a more “iconic” look less dependent on the brand name being present for recognition. This is sure to continue into 2017, as brands want to reach the visual equivalent of being a “household name,” from our smartphone and tablet screens. Speaking of brands moving to more of an iconic look, Zendesk followed in those same footsteps last year when they dropped their lotus flower logo and highly recognizable (for better or for worse) Buddha mascot. They moved to an entirely new branding language, built out of simple shapes, flat colors, and friendly animations. The move sunsetted a mascot that was divisive for some, and swept in a more future-proof system that they were able to apply across their whole product line. The kinetic interaction of the shapes for each product explain, in terms simplified down to an emotion, the role of each, and how they work together under the Zendesk umbrella. It is an extremely ambitious move for a brand, building a new visual language from the ground up, but one that I am hoping carries through with other brand redesigns in 2017. In early 2016, we got a big branding update from Uber, with an update to their logo as well as to their app icon. Here we have another move to a more “iconic” look with the app icon, but who’s to say how successful it really is. The logo change was met with, as you might expect, quite a lot of complaints. It certainly seems like the kind of design change that would leave a frequent Uber rider confused trying to find the icon on their home screen. Kodak, one of the most well-known companies in the photography sphere, missed out big time when they acted too slowly to stay on top of the consumer market with the modernization of film to digital. Their core market has shifted from regular consumers to a more industrial/professional context since that time. However, they are starting to edge back into the consumer market, and with that move decided to make a throwback to a logo from a bygone era, when they were more mainstream with that group. The new design uses the available real estate of the recognizable, camera shutter logo in a much better way than the original 1971 design. While it is a step backwards, in a way, it puts Kodak back in line with a trend towards more color rather than sleek reliance on white space. Unlike other brands on this list, Netflix wasn’t redoing a logo or icon. Instead, they simply added a new element to their brand language. The new N icon serves as a stand-in for the full Netflix logo in instances where the longer logo won’t fit. There are no plans to redo the current logo with this more ribbon-like look, which some suspect is meant to bring to mind the “card” layout of Netflix’s UI. This new capital-N logo is part of a continued push towards more branding flexibility across a variety of digital platforms such as mobile apps and social media, similar to MasterCard’s update. Pandora came out with one of the year’s safest redesigns, moving from an all-uppercase serif logo in navy to an all-lowercase sans-serif logo in bright blue. Yawn. Of course, the geometric rhythm of the letters definitely seems more in line with the times, but it is so forgettable that there is practically nothing left. In addition to the new wordmark, Pandora came out with a monogram P logo to use as their app icon and in other square contexts. In 2017, we are sure to see more of these variations on logos to personalize them to different subsets of users. I have to admit… I was pretty disappointed when I saw that Meetup changed their logo! It was always a pretty dorky logo, but a comforting kind of dorkiness, and absolutely the perfect concept for a service where users create their own groups to meet others based on interests. The new logo just feels awkward, and not the relatable kind of awkward like the old logo. Not just that, but the entire rebrand was all over the place. Here the swarms make a little more sense. Still, the animated logo is pretty cool and definitely a trend that has been increasing in popularity over the last few years. Maybe 2017 will be the year animated logos really take off. The new design is slimmer and more balanced overall, fixing something weird in the tilted E. The new logo is more proportional and designed for the express reason to look better at an ever greater variety of scales. First and foremost, flat colors and simple shapes is the name of the game. With a few obvious exceptions (like Instagram’s abundantly colorful gradient – though this is still a flatter rendition of their old app icon), logo designers are simplifying their logos down to the bare essentials. Some are going for a truly iconic look, especially to grow their recognizability factor in a screen full of tappable icons. Though many brands are decreasing the number of colors in their logos, the colors that remain are going big and bold. Neon colors are in, both as a singular color and as part of a vibrant color scheme. Digital accessibility is a growing concern. We are moving to using smaller screens more and more, and it is vital for brands to have logos that work at these small sizes. Dell and MasterCard are great examples of this trend, if one could call it that. Finally, there are some trends that have been growing the last several years – maybe 2017 is the year they take main stage. Animated logos are becoming increasingly accessible due to faster internet connections and more use of the internet within apps. And the trend of many variations on the logo as demonstrated by Pandora and Meetup is an interesting one that could take off if done well. What was your favorite recent logo redesign? Share in the comments below! Every year, a new social network seems to be taking center stage. To keep up as a marketer you need to wear many hats – a Twitter hat, a Facebook hat, Pinterest, Instagram, and LinkedIn hats, maybe even Snapchat! With all there is to learn and know about social media marketing, you might feel lost. Fortunately, there are a vast number of great guides and courses out there to teach you the ins and outs of social media – for free! Plus, as social networks change and grow, new guidance is coming out all the time. You could try to figure out everything on your own, but why would you, when there are so many tools out there to help you? If that’s not enough to convince you, maybe this will be: your competitors can access these resources just as easily as you can. And, of course, social media is always changing – so even if you are already a social guru, it is important to keep your skills sharp and learn new tricks. 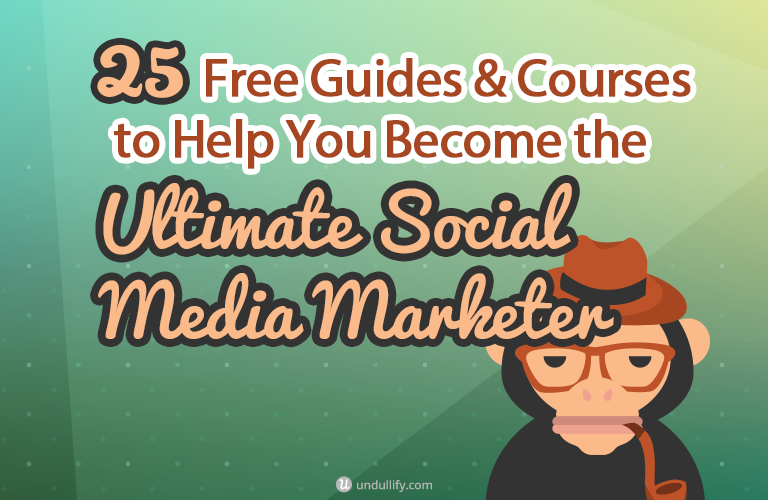 With that said, let’s explore the many free social media courses that can help you feel dramatically more comfortable marketing on Facebook, Twitter, Pinterest, Instagram, and more. Starting from scratch? 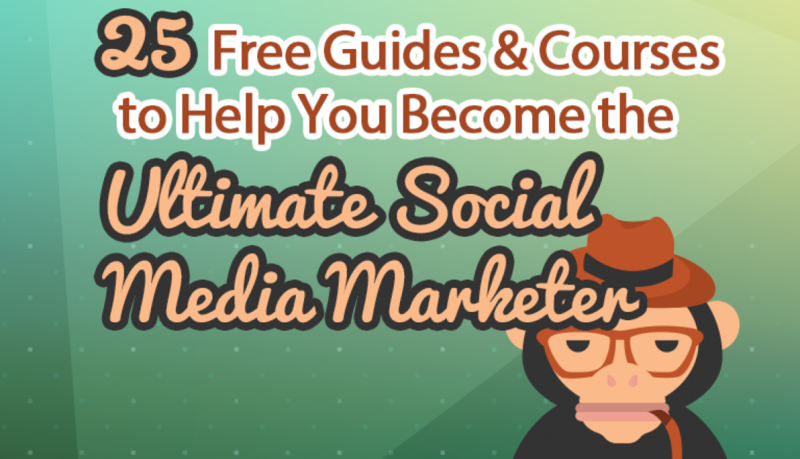 These free social media guides and courses are great primers to social media marketing as a whole, across a variety of social networks. In addition to building your skills across many platforms, they can also help you decide which social networks are right for your business. Aimed at complete and utter beginners, the Buffer email course is the lowest time commitment you could possibly find in a social media marketing course, short of plugging your brain in Matrix-style and doing a data transfer. Even if you are the busiest person in the world, you still have time to get the basics down with Buffer’s email course. Moz is well-known for their Beginner’s Guide to SEO, but the Social Media guide is every bit as in-depth as the SEO guide. With 12 chapters spanning various social networks, best practices, ROI, and the combination of social media and blogging, this guide is the detailed guide you’ll want to sink your teeth into. 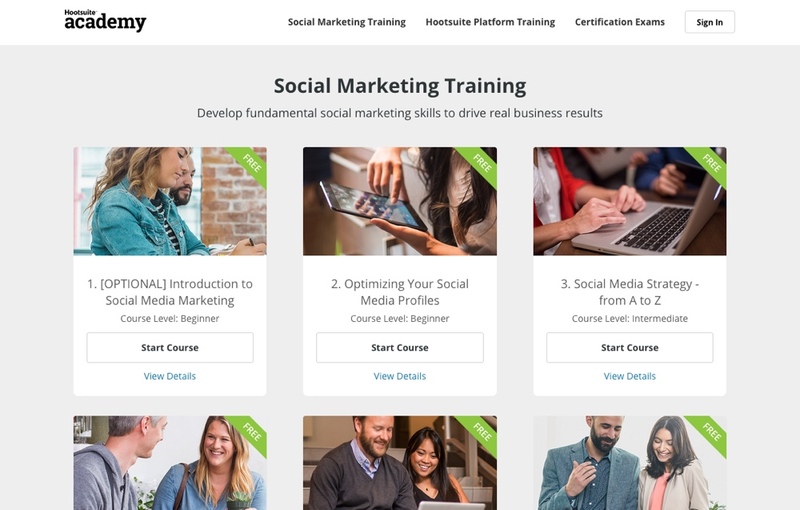 HootSuite Academy offers six free social media courses for developing your social marketing skillset, ranging from beginner level to intermediate. 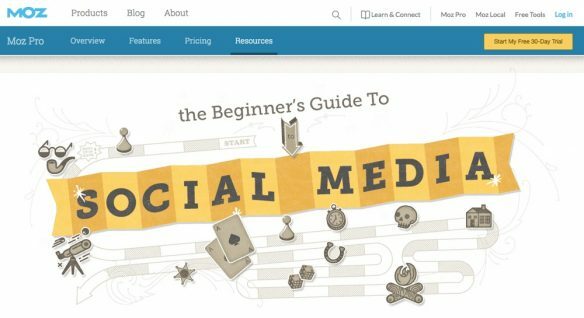 Instead of focusing on any particular social network, the emphasis is on building the fundamentals that you can apply to your platform of choice, with course titles like “Optimizing Your Social Media Profiles” and “Growing Your Online Community.” Once you complete all six, if you want to prove your skills, HootSuite offers a Social Marketing Certification for $199. This intro-level social media marketing course from Constant Contact rapidly takes you through all the major social networks, including Google+, YouTube, and Snapchat. 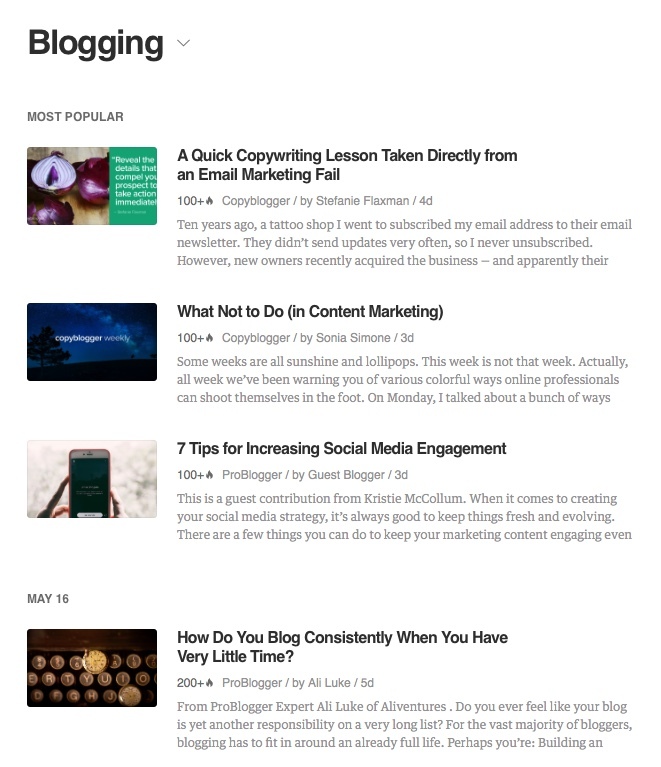 There’s even a “Blogging 101” and a section about reputation management. 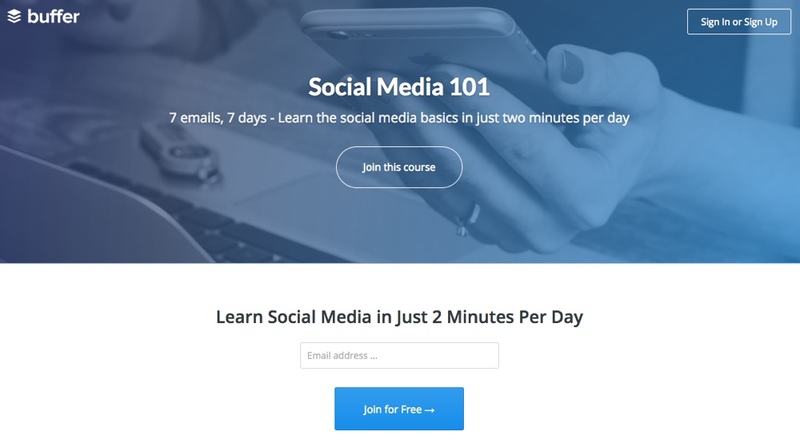 Take this course if you are looking for step-by-step guidance for getting started on many social networks. 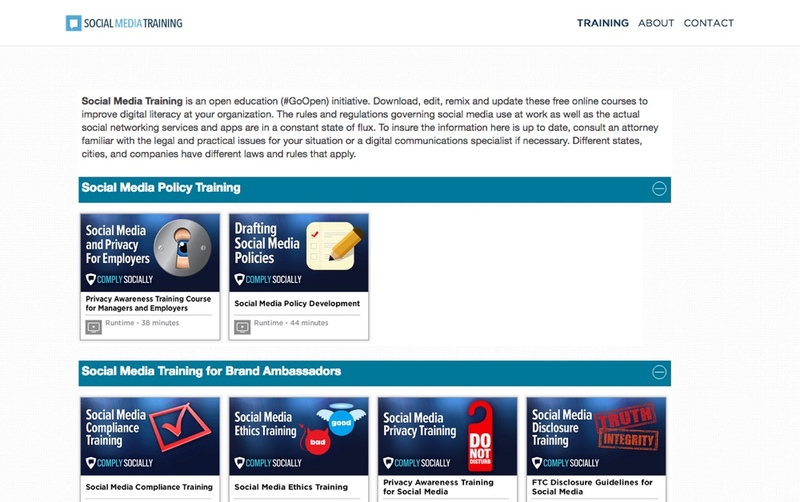 Social Media Training offers free, well, social media training courses on a variety of legal compliance issues you may not be aware of. With courses about intellectual property, social media ethics, and privacy, this isn’t one to miss. Social media marketing advice for brands can sometimes feel very out of touch for smaller local businesses that operate a brick and mortar location. When you are targeting a highly specific area, there are a lot of challenges that other brands may not encounter. This guide fills in the gaps to make your marketing truly engaging to your local audience. Guides and courses are all well and good, but sometimes you just need a quick cheatsheet. From image sizing guidelines to keyboard shortcuts to the best times to post, this infographic has you covered on Facebook, Twitter, Pinterest, YouTube, and Instagram. Need to brush up on your Facebook skills? These three free Facebook courses provide the chance to laser-focus your social media marketing on the most universal social site on the internet. From setting up your page, to understanding engagement, to navigating the tricky Power Editor, these are your go-to guides. It is in Facebook’s best interest to offer high-quality training for its own social network – after all, well-trained marketers are good advertising spenders! 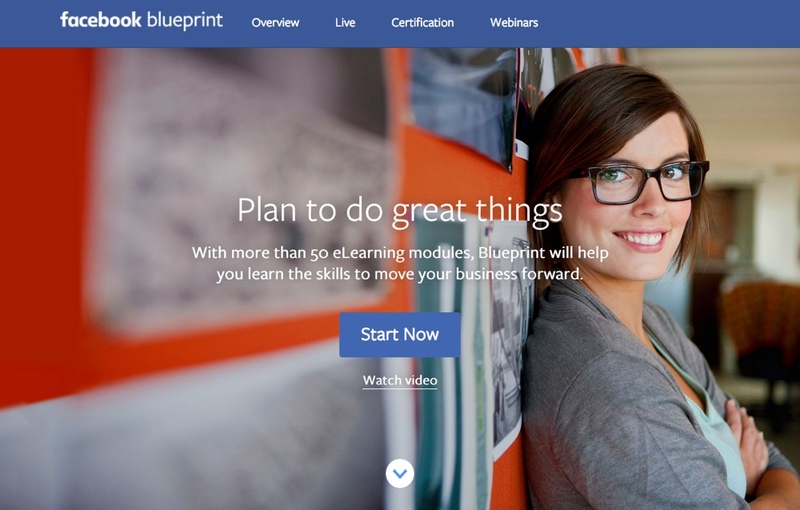 Facebook Blueprint is some of the most comprehensive social media training offered by a social platform, and you’re sure to learn something new no matter what your skill level. Ever considered making a “swipe file” of all your favorite Facebook ads so you could steal (ahem, learn) from them later? Now you don’t have to. 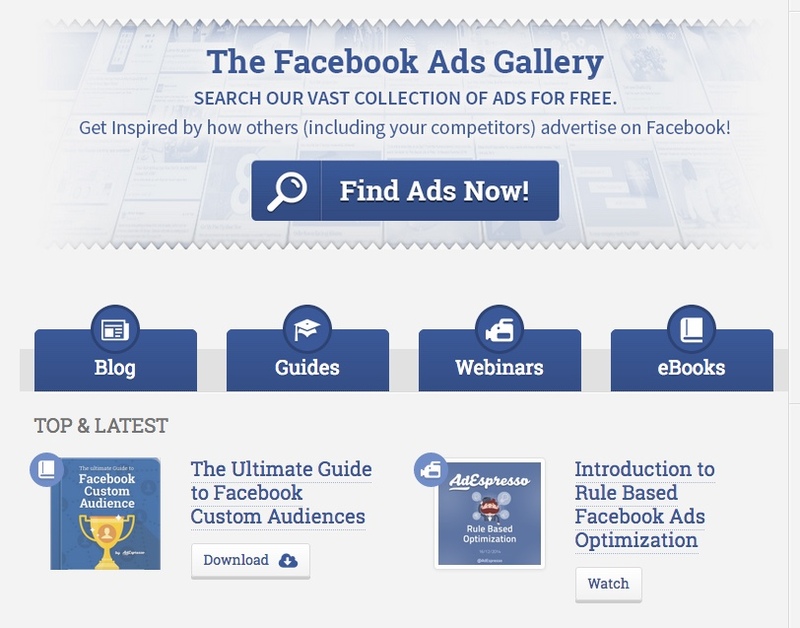 AdEspresso has over 21,000 great Facebook ads in their searchable database, along with offering a handful of helpful Facebook advertising guides and other learning materials. Don’t have a lot of time? 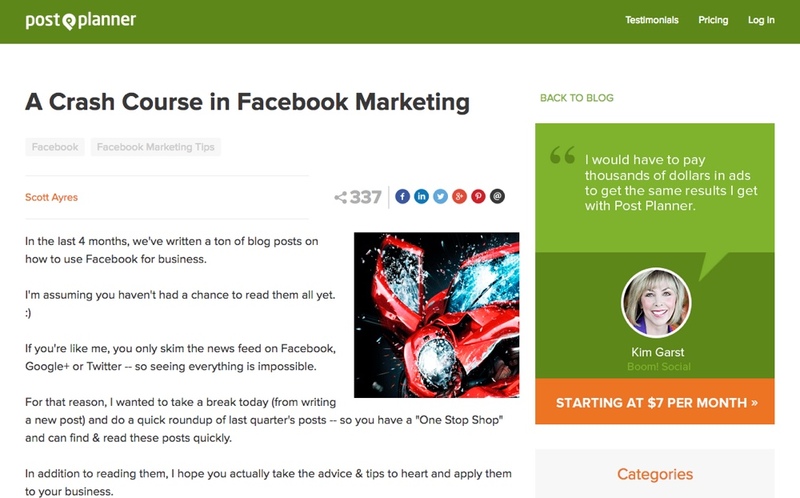 Post Planner’s “crash course” is a great way to get your feet wet with Facebook marketing. If you need the essentials in a minimum amount of time, this chaptered guide is the way to go. Scroll through categories like “Fan Page Best Practices” and “Content for Your Facebook Page” to find exactly what you need assistance with. Twitter has one of the steepest learning curves of any social network to users who’ve never used the site before, because micro-blogging is such a foreign concept to so many people. It can be even more daunting if you are not only not incredibly familiar with Twitter, but are also trying to reach new followers for your business. 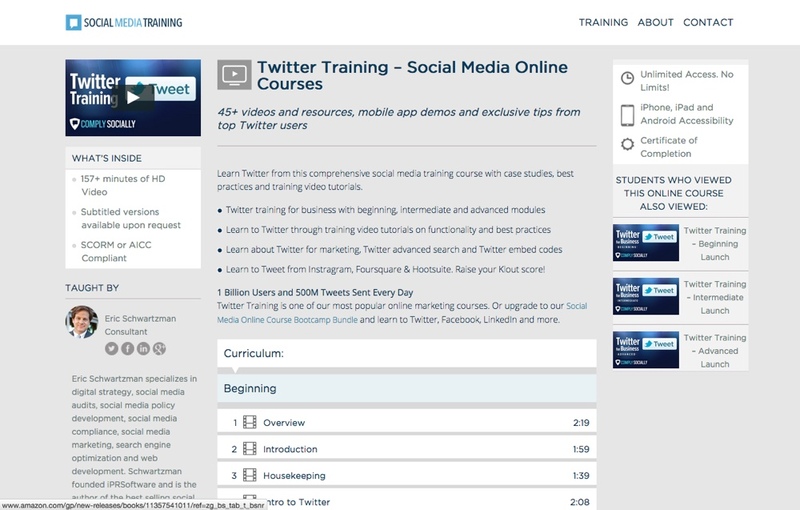 These Twitter courses and guides will help you get up to speed. It is my personal opinion that you should always begin your learning at whatever official guide the service offers. 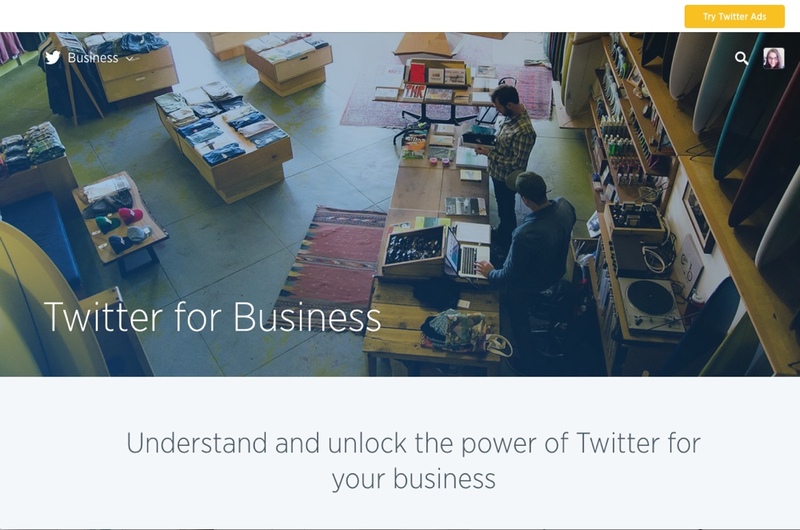 While it may not go into many advanced strategies, you can take in the rules and read exactly what Twitter is looking for from brands in their Twitter for Business guide. This extensive free Twitter course offers over two and a half hours of video guidance, from the absolute basics (“Anatomy of a Tweet”) to the more potentially confusing (“Engaging People on Twitter with @Mentions and Hashtags”). 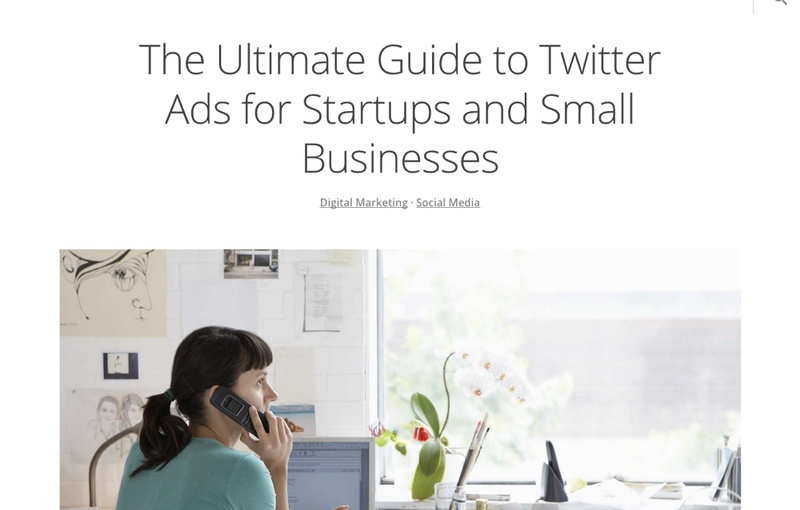 This extensive, intermediate to advanced level guide teaches you everything you need to know about using Twitter ads. Beloved by lifestyle companies, foodies, and any industry that can take awesome photos, Pinterest definitely requires the right kind of brand and attitude to reach your desired audience. 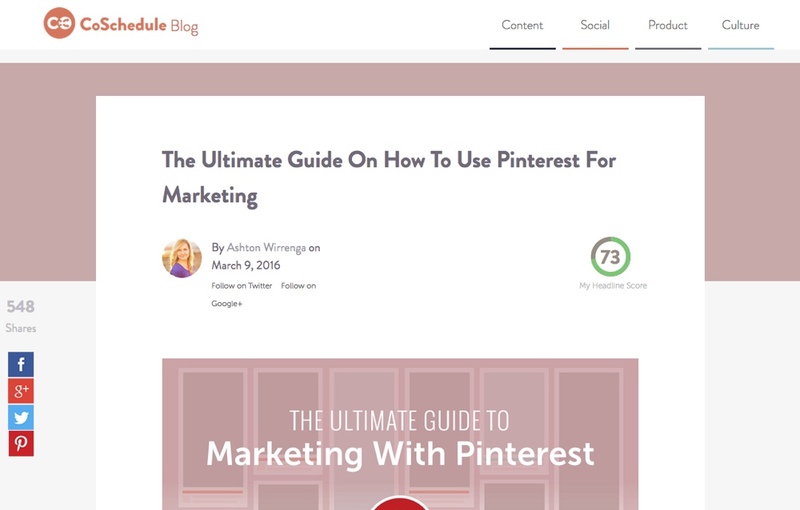 These free Pinterest guides form an excellent backbone to your marketing efforts. This guide, straight from the source, will give you a quick overview of all the great ways brands can take advantage of Pinterest. It also offers a great introduction to Pinterest Analytics. 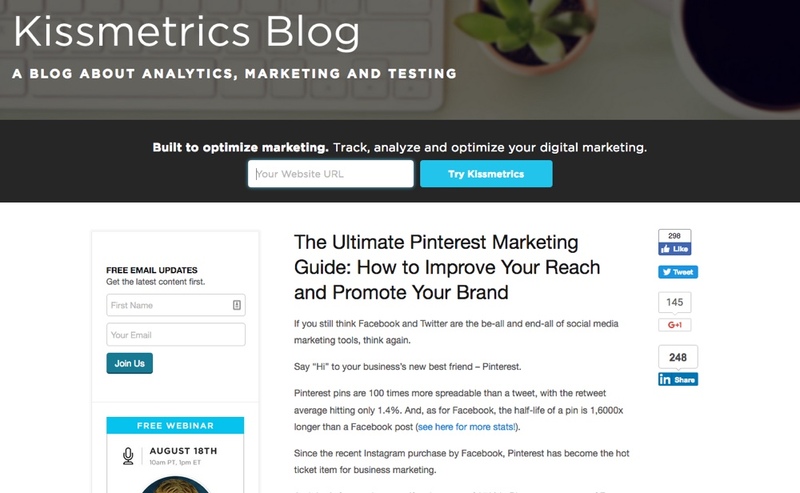 Kissmetrics has done it again, this time with a long and extremely detailed ultimate guide to Pinterest marketing. With great examples, tips, and actionable advice, this is a great inspiration to get started with your own Pinterest marketing campaign. I love CoSchedule’s simplified and illustrated approach to every topic they cover on their blog, and this massive Pinterest guide is no exception. AdEspresso’s step-by-step guide drops you right down into the process of creating and spreading your Pinterest account. 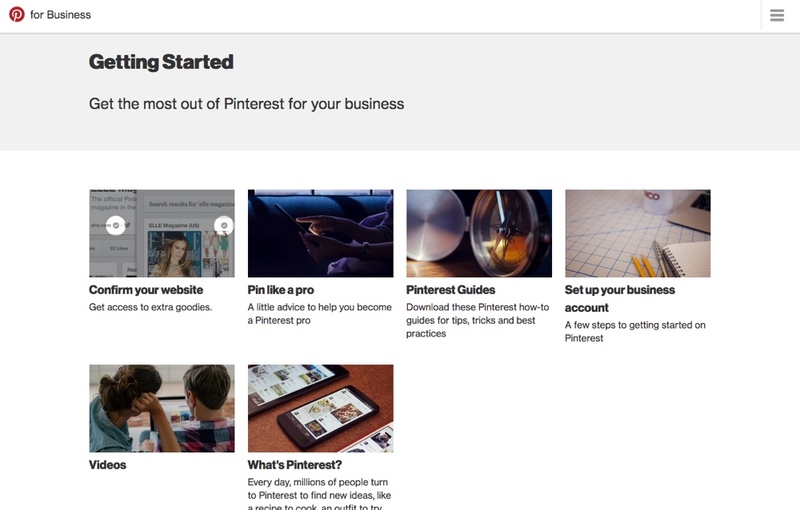 Towards the end, they even run you through the process of creating Pinterest ads. There’s not much to Instagram, right? Just snap a photo, throw on a filter, and go, right? It turns out that there’s so much more to Instagram than what meets the eye. 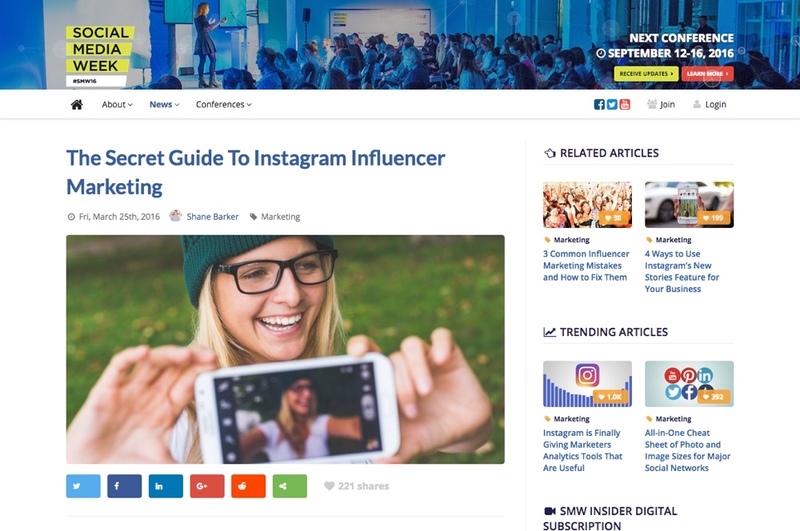 If your aim is to grow a following and build influence for your brand on Instagram, these free guides will get you there. Instagram’s business guide is very brief, but it does include some great pointers for brands starting out on the platform. 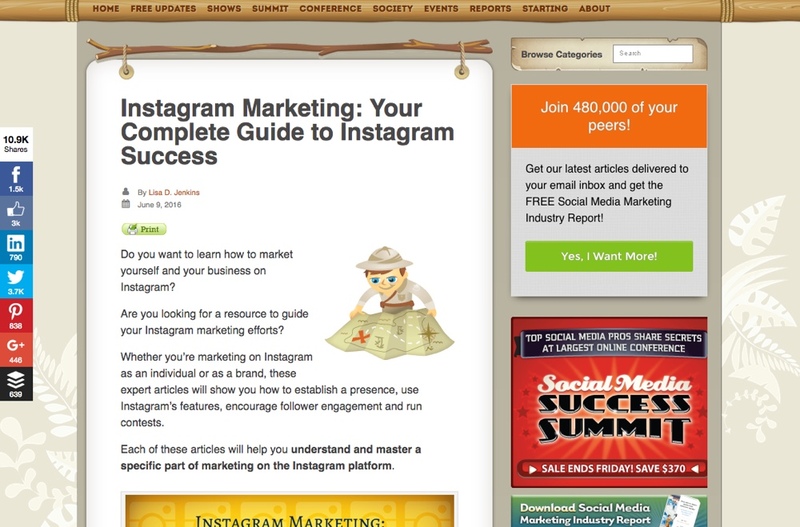 This “complete guide” pulls together a variety of other Social Media Examiner guides on various Instagram topics into a tidy, chaptered list of resources. 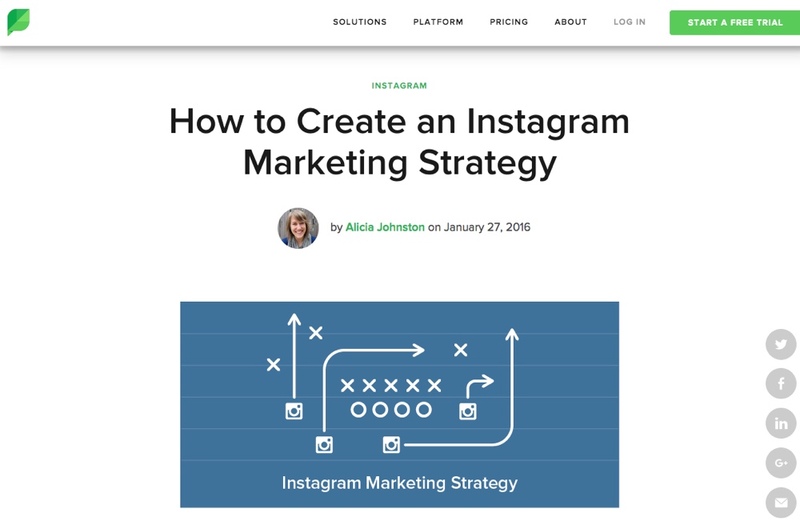 This long Sprout Social post goes into detail about how exactly to build an Instagram marketing strategy from start to finish. This is a great higher level piece to consider after you’ve gotten started but before you’ve got a game plan in mind. “Influencer marketing” involves building a marketing strategy around “brand ambassadors” who can share your products or services with their audience in a natural and targeted way. This detailed Social Media Week post tells all about how to work with influencers to grow the presence of your brand on Instagram. Got your eye on another social network, like Snapchat or Tumblr? 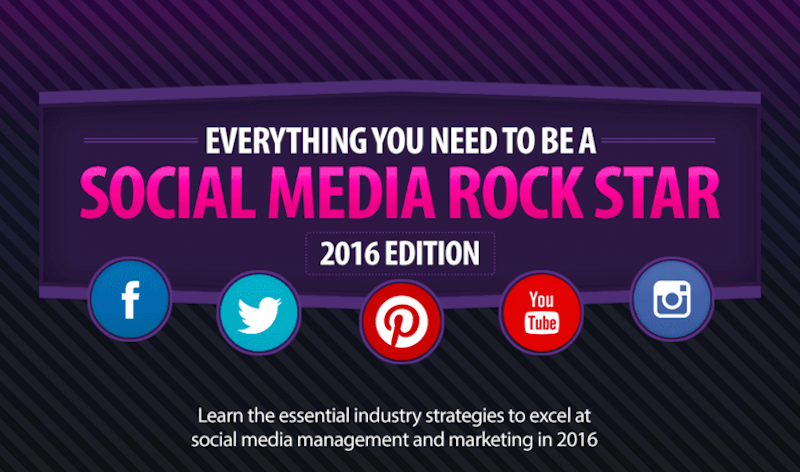 There are some great social media marketing guides and courses for slightly less mainstream networks. Need to connect with a B2B audience? Looking to market your services in LinkedIn Groups? 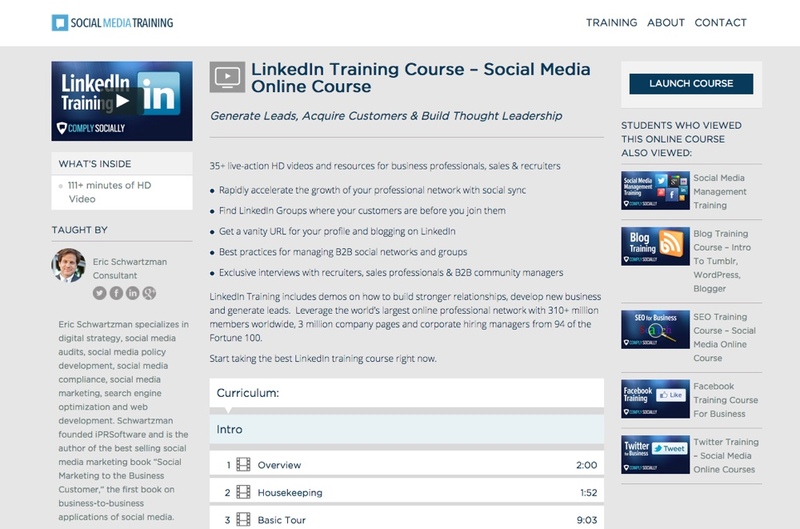 Social Media Training offers a free LinkedIn course with nearly two hours of lessons spanning 35 videos. If you are looking to reach a young audience in a space that still has relatively little competition, look to Snapchat. 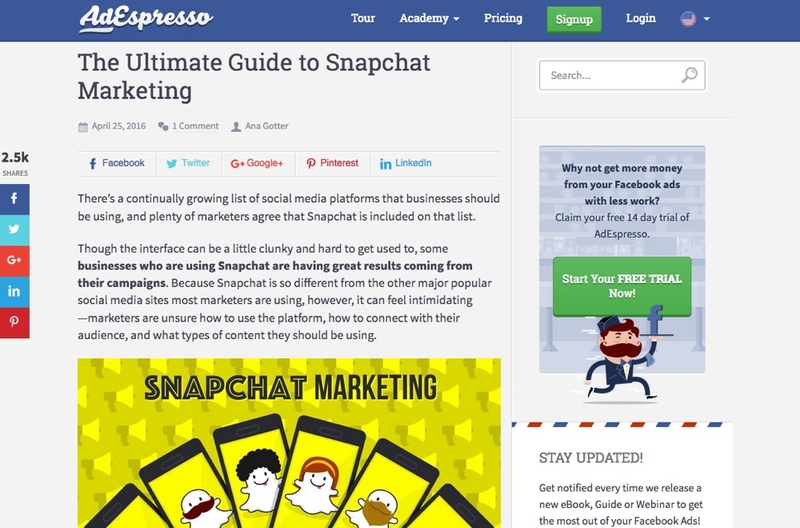 AdEspresso has a detailed guide to getting started and growing a following. If you have a fiercely loyal young fanbase, Tumblr might be the space for you. 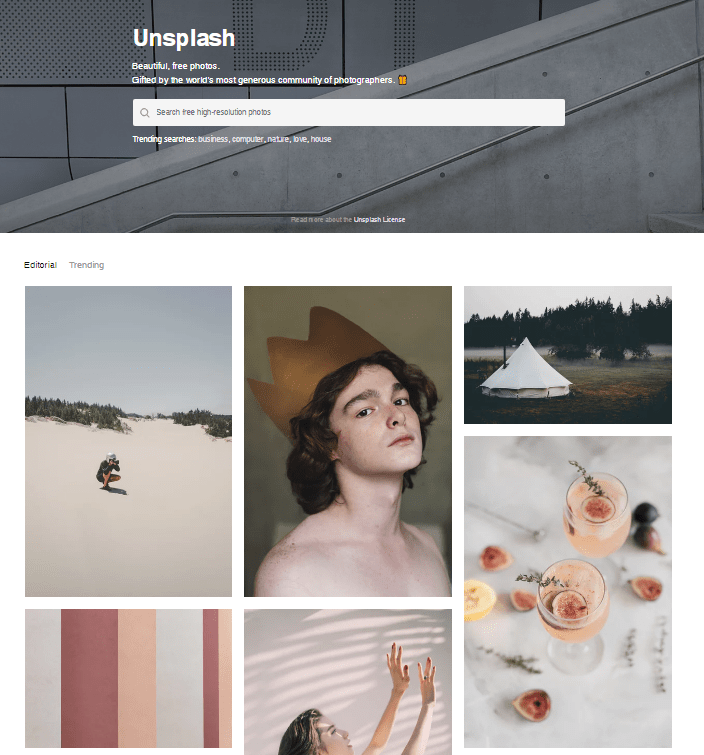 Connect your brand with popular culture by creating and maintaining a Tumblr blog, which allows you to “reblog” content much like you’d retweet on Twitter, except usually with many more characters. 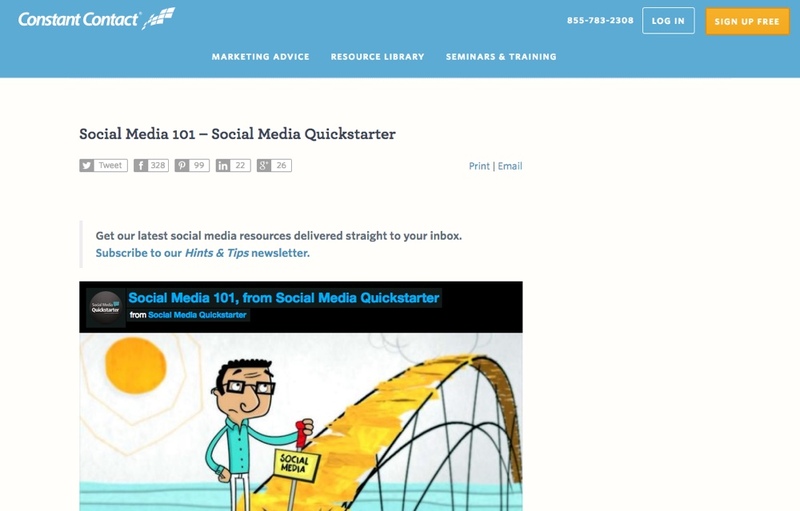 SocialMediaToday’s guide is an excellent beginner level piece to engaging this audience. If Reddit chooses to turn their firehose of traffic on you, your website will probably crash. However, it’s the one kind of crash marketers take as a success – the kind that comes with hundreds or possibly thousands of brand new visitors! 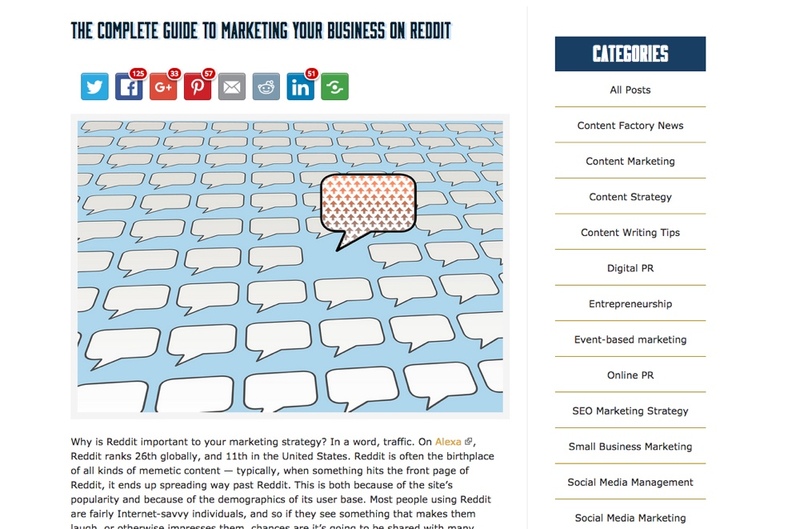 This guide will teach you the ins and outs of Reddit and how to market without looking like a marketer. 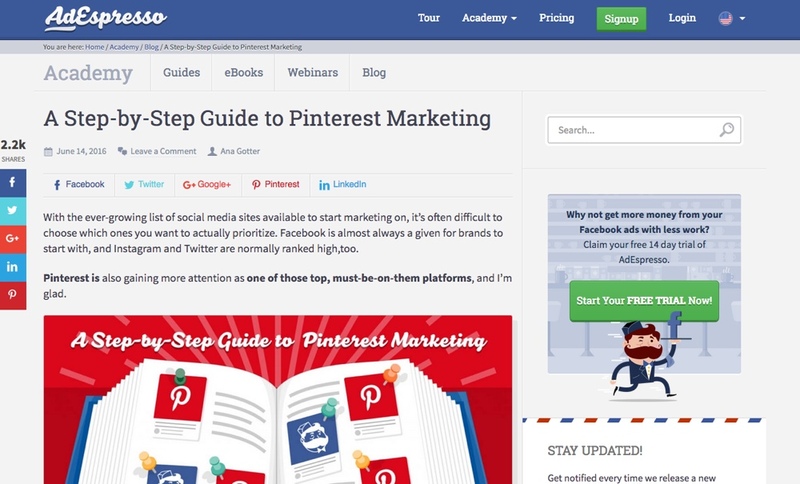 Whether you are looking to build a presence on Facebook or Tumblr, there are detailed guides and sometimes even online courses, often freely available, to help you learn all the ins and outs of that social network. Don’t go it alone – other marketers have been there, done that and spelled things out so you don’t have to. 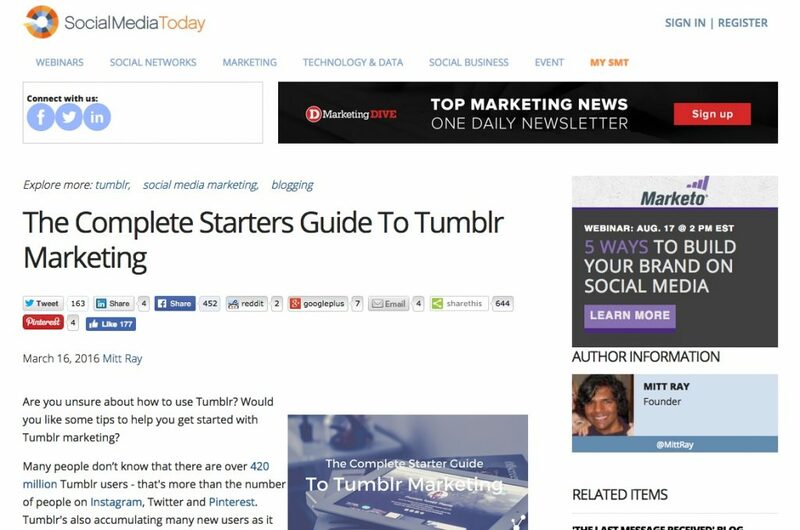 Since new guides and courses for social media marketers are coming out all the time, this is by no means a complete list. If you have a favorite resource that isn’t listed here, let us know! Your ‘About Us’ page. It is the face of your business, the explanation of who you are and what you stand for. It is probably one of the most-trafficked pages on your entire website. And, all too often, it is neglected, outdated, and unloved. All things considered, your ‘About Us’ page is about more than what your product or service is. It’s your chance to showcase your mission and values, your talented team, and what sets you apart from the crowd. 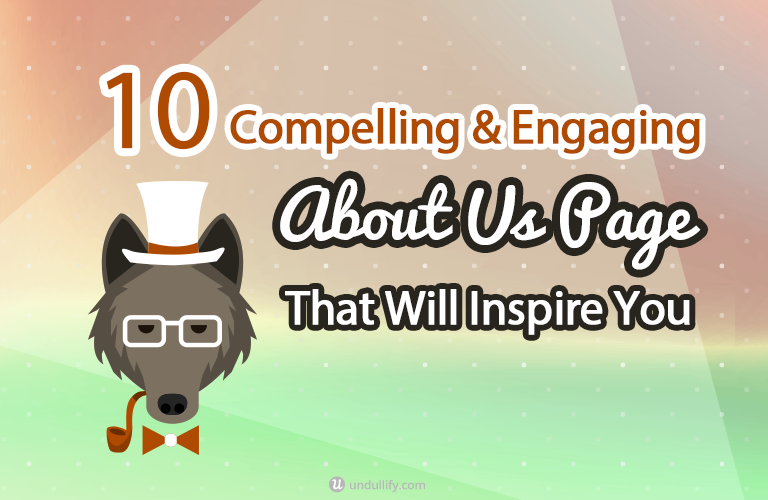 The following ten ‘About Us’ pages all go above and beyond, with compelling web design, engaging media pieces, and other features that any business can learn from. Maybe they’ll inspire your next ‘About Us’ page redesign? If ever there was a time to skimp on professional photos, it’s not now. This is the page that literally defines your brand… so don’t just send the intern around with a smartphone camera or, worse, download a few stock photos. Instead, invest the capital into having a professional photographer wander around your office, snapping photos of your team at work. With their engaged team and unique and beautiful office space, Bluecadet is a shining example of the power of original photography. If the journey to where you are today has been long and winding, a timeline is the perfect way to visually tell your company history. It also gives you a great spot to humblebrag about your amazing accomplishments, and explain changes in direction that aren’t as easily understood through text. Moz is an example of a company that has gone through many transitions over the years, from a name change to office moves to huge changes in their core business model. All of that is explained in a reverse timeline that takes you back and back as you scroll down the page, all the way down to 2004, when Rand Fishkin founded the Seattle SEO company with his mother. More likely than not, your business can be defined – if not explained – by a few key numbers. How many sales have you made? How many subscribers are you supporting? How many countries do you do business in? 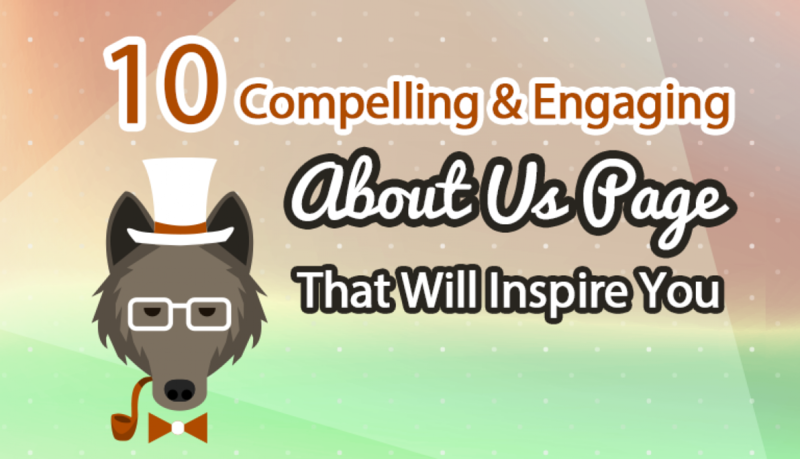 These numbers are by their very nature extremely visualizable, and give you the prime opportunity to turn part of your ‘About Us’ page into a sort of personalized infographic. Airbnb highlights a few key stats on their ‘About Us’, perfectly color-coordinating a map, some logos, and the accompanying data. Alongside two short paragraphs, these visuals do all of the explaining, in a crisp and immediately understandable way. For some companies, capturing your customers’ imaginations and showing them the true potential of your product is the key to growth. Illustrations are a great way to do this with style, sending visual cues about what your company does and what you stand for. Uber, the app that is reinventing the taxi industry, uses their ‘About Us’ to showcase the fact that their service is key to building the cities of the future. The sleek, modern design in cool blues and greys imparts the message that a network of transportation options to anywhere is available at the push of a button. If your business exists to support your customers, why not devote your ‘About Us’ to them, too? This is a strategy especially useful for B2B companies, but applicable to any brand that wants to sustain a strong sense of customer loyalty. Celebrate your clients’ accomplishments and they will celebrate you. A company that is doing just this is Hover. Hover sells hassle-free domain names and is always looking to inspire its users to take the first step towards making their ideas a reality: registering the domain name. On their ‘About Us’ page, they highlight some of their favorite projects from across their customer base. Sometimes you just can’t beat a video for how quickly and succinctly it can get across what you do and why you do it. Background video is a very popular web design trend, and using it on your ‘About Us’ can give it an atmosphere that you just can’t give it any other way. Yellow Leaf Hammocks does this beautifully, with a colorful background video showing how their products are produced by hand, the lives of the people who make them, and what they look like in use. As the text at the top of the page says, they look ridiculously comfy – and more than any picture could do, the video demonstrates this. I want a hammock now! Why not put your ‘About Us’ to work for you? In some cases, the ‘About Us’ might be the page that determines whether your visitors are going to convert or stay lurkers. If that’s the case, it might be a good idea to push them towards something – such as subscribing to your newsletter, for instance. One example of an ‘About Us’ doing just that is over at Blog Tyrant. While it gives a strong introduction to the blog and the blogger, it also gives some very compelling reasons why you should join his mailing list. If your business involves an online app or service, the ‘About Us’ is a great way to give people a taste of it without signing up. Screenshots, videos, and animations are all great ways to show off how easy and fun your tool is to use. Canva’s ‘About Us’ does a great job introducing users to their app and how to use it, with animated interfaces, testimonials, and a call to action at the end. Who says your ‘About Us’ needs to live on a ‘About Us’ page? If who you are, what you do, and how you do it are a hugely compelling part of your business, why not put it front and center on your homepage? Cultivated Wit is a group that brings together comedians and developers for Comedy Hack Days, so it makes sense that they would showcase their unique selling proposition right on the main page. They do so artfully, with a sparse amount of copy alongside colorized background videos. If your people are your best asset, devote your ‘About Us’ to them. Many brands have found unique and creative ways to show off their people, from using illustrated versions of them to headshots that switch to an amusing image when you roll over them. Cornett took another unique route, asking each of their employees to bring in some objects that are meaningful to them for a top-down photo. The effect turns the ‘About Us’ into a fun sort of eye spy game where visitors can pore over the photos picking out surprising items from the rest. As you are deciding how to approach your own ‘About Us’, you can use the type of information you plan to include as a guide. Do you want to showcase your team? Your company culture? Your story? Based on that decision, you can create or curate assets like photographs, illustrations, and videos that suit your brand. Your ‘About Us’ doesn’t need to be bland and corporate – make it shine using one or more of the strategies above! We would love to see your favorite ‘About Us’ pages (or even your own) – share them in the comments below! Stand out from the crowd on Pinterest and use these 3 super easy hacks to drive traffic to your website. 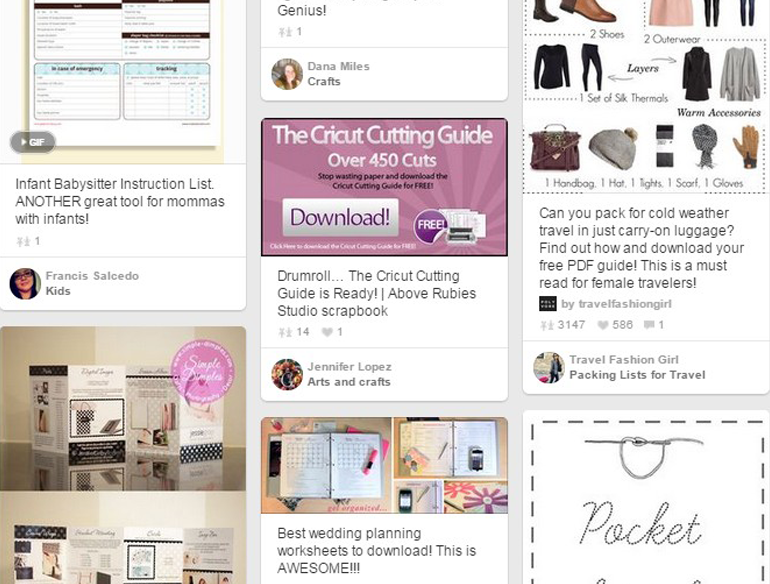 Are you using Pinterest to drive traffic to your website? Growing faster than any other independent website in history, Pinterest burst into the social media scene a few years ago to gather a massive 47 million users this year. Pinterest now drives more traffic to websites than YouTube, Google+ and LinkedIn combined. That’s a huge opportunity to use Pinterest to drive traffic to your website. But with so many other pins to compete with, what’s the best way for your images to stand out from the crowd? In this post, I share 3 little-known but super easy hacks that will make your Pinterest images stand out. 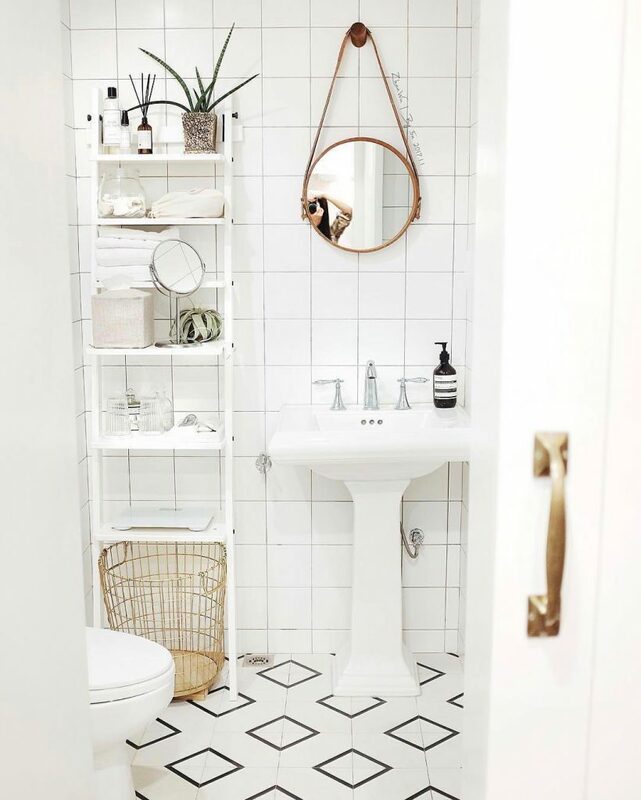 Sometimes less is more, and one of the easiest hacks to get your Pinterest images to stand out is by using plenty of white space on your images. Constant Contact’s Pinterest image may not be in the center of this pinboard, but it still manages to stand out by using plenty of white (or in this case blue) space to give the image some breathing space. Another way to give your images space is to use rounded corners or circles instead of the standard squares or rectangles. This rounded image is stand out in the sea of rectangles and squares. 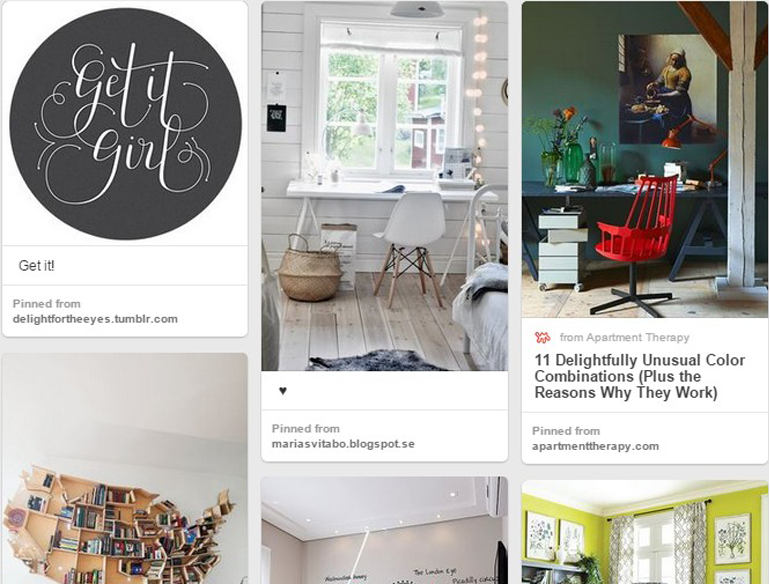 Use circles or rounded corners on Pinterest images to stand out from the crowd. Adding a call to action to your Pinterest image helps convert pinners and increases engagement. It works in the same way as adding call-to-actions on your website helps focus visitors and encourages clicks. A simple but compelling call to action could help increase engagement. Add a compelling call to action to your Pinterest images to drive more traffic to your website. Long, tall, skinny images take center stage on Pinterest and command some valuable visual real estate. This eye-catching image of a rocket stretches long over the pinboard and draws the eye in. 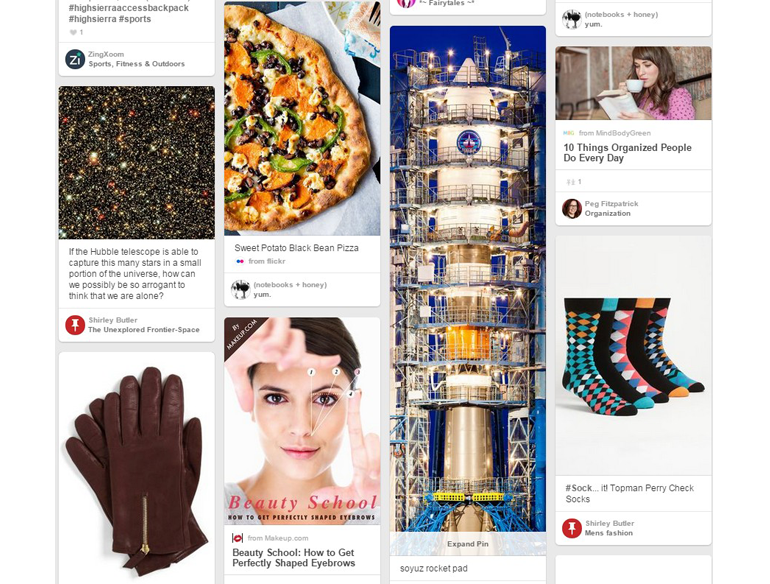 Take command of a Pinterest board with long, tall, skinny images. I hope this gives you a few new ideas to turbocharge your Pinterest content and give them an extra boost. Have you got any easy hacks that’s been working for you? Share your tips in the comments below. The images on your website draw a lot of attention. 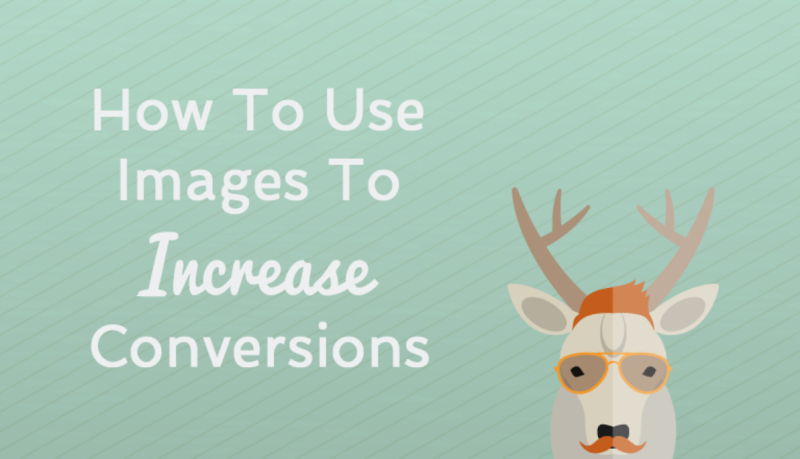 Choosing the right images will increase conversions. Here are some proven ways to help you make the best image selection to boost your conversions. Rule #1 for any e-commerce shops selling a physical product is to always use high quality product images. Don’t use the manufacturer’s images if the quality isn’t high. Learn how to take your own, and invest in a professional to help you with editing the images to get them looking right. 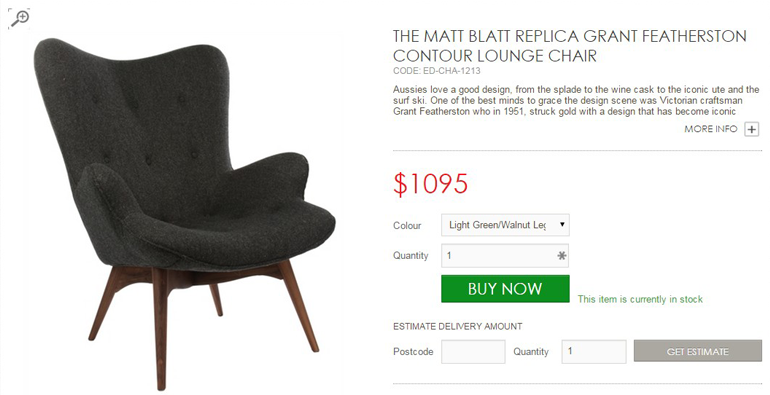 Compare the pair: The trendy Grant Featherson replica contour lounge chair is a popular piece that’s sold everywhere. Take a look at how two different furniture shops make use of their product image. Which one draws your attention in more? A large, over-sized product image, with the ability to enlarge gives visitors the ability to properly look at the offering and increase conversions. The quality and size of product images matters. 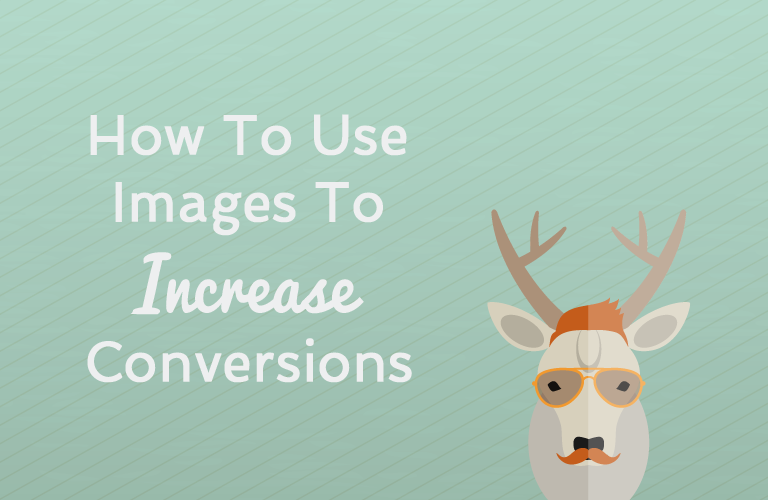 Use high quality images to help boost your conversions. 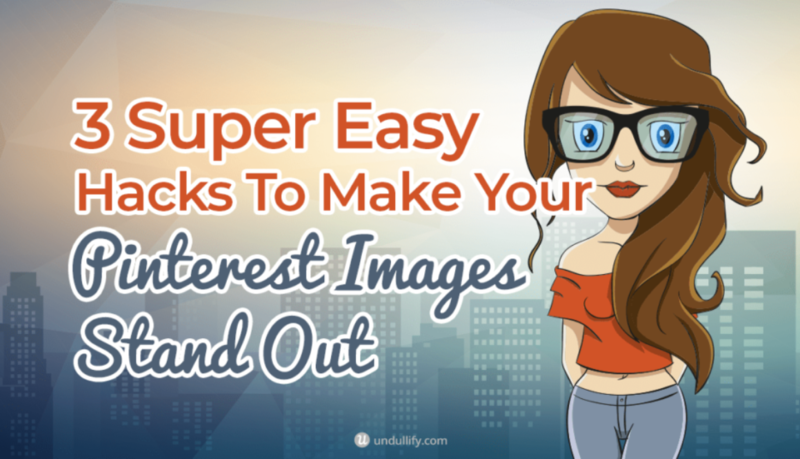 Use high quality images to help boost your conversions. Show off your product in as many ways as possible with images taken from different angles. Give me reasons to be confident product quality with zoom and detailed views. This will all help reduce the gap between offline and online shopping experience. 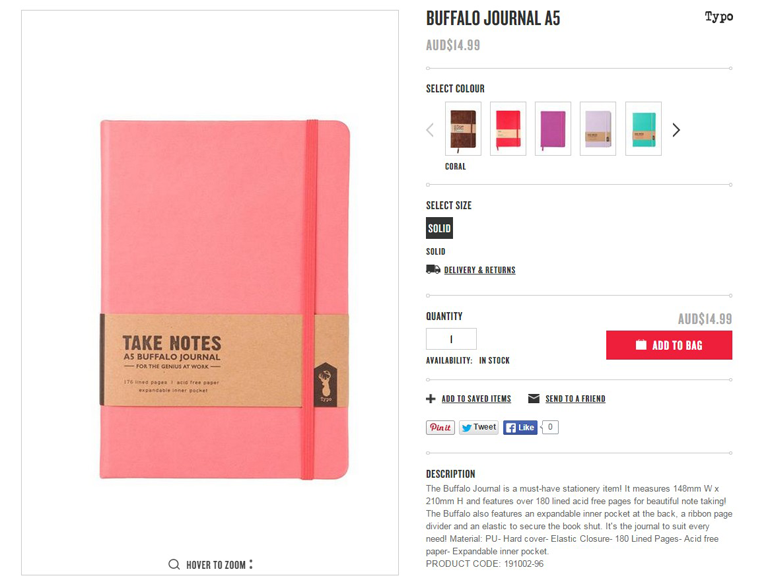 Compare the pair: Moleskin sells notebooks. Typo also sells notebooks. Which one gives you enough confidence, trust and visual information to hit that buy button? Typo only shows one image of the notebook. Does that give you enough visual information to hit the “Add To Bag” button? Moleskin covers all their bases with multiple product images showing detailed and angled views of the notebook. Moleskin’s given thought to how they present their product, and this goes towards enhancing the shopping experience and making it as close to the real thing. Don’t just show the product, show it in its context. Let me imagine using it. Amazon’s Kindle Paperwhite has a unique selling point: “No screen glare in bright sunlight”. No better way to communicate this than with a contextual image. The Kindle’s unique feature “No screen glare in bright sunlight” gets the perfect contextual image to match. Choose your images carefully. Make sure they are relevant to your product or service, and useful for your visitor. Because when you have the wrong image, people either ignore it or become confused. 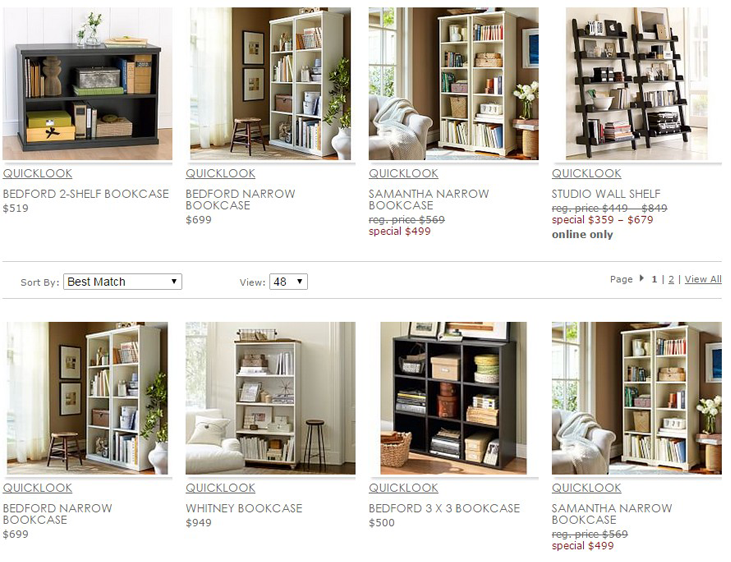 Example: It makes sense for visitors to Pottery Barn to see bookcases placed in context of their surrounding. It shows how the product will look in its natural environment, and gives it visual context. It helps to give products like bookcases visual context. 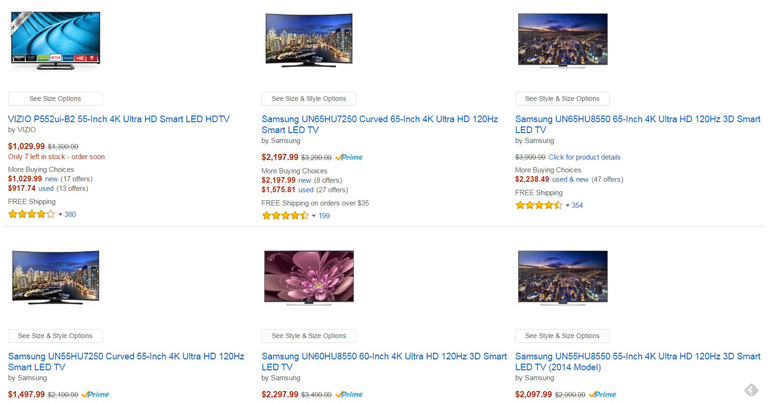 It doesn’t make as much sense, however, for Amazon to display images of television screens. Televisions all look pretty much the same. It’s hard to tell the difference between one TV to the next, without looking at the text descriptions. What is important to someone looking to buy a television are the technical details and description. The product image? Not so important. This eye-tracking study shows the difference in visitor behavior when browsing bookcases versus televisions. Visitors concentrated on looking at the product images from Pottery Barn, as opposed to concentrating on the product descriptions for TVs on Amazon. When using images, make sure you have a good reason for doing so. People can’t help but to follow the direction in which we are guided. We just can’t seem to resist certain instinctive urges, and using directional cues are a great way to direct attention to important elements of a page that leads to a conversion. Call-to-action buttons, headlines, lead generation forms, and powerful testimonials are the main elements that you should use visual cues to draw visitors’ attention. In this eye-tracking study, the heat-maps produced by testing with real customers show how where the model looks changes customer behavior. Where the model is looking at the shampoo (versus out of the page), customers followed the direction of her gaze straight to the product. Visual cues such as arrows or line of sight objects are also effective tools in creating a directional cue. 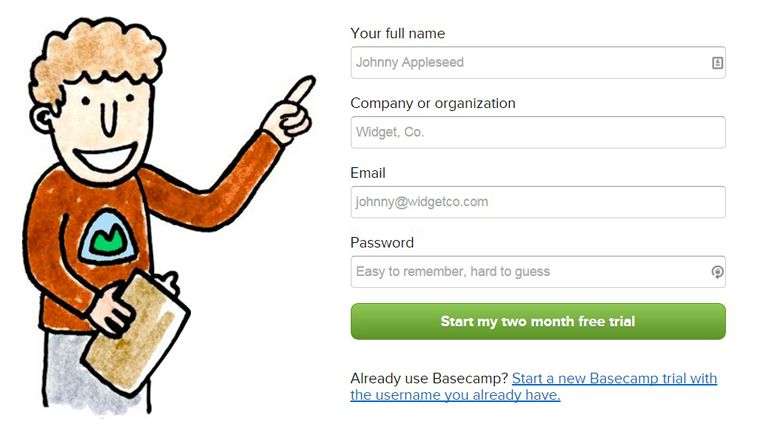 Example: Basecamp prefers to use something less aggressive than an arrow, but this illustration of a person pointing to the sign-up form works just as well as an arrow in directing a visitor’s line of sight. We just can’t help but to follow when there’s an arrow or someone pointing. Ever bought something on sale impulsively, just because the sale is about to end and you don’t want to miss out? Though we’ll all like to think that we make rational decisions, the truth is we make decisions when our emotions are triggered. Our brains are designed to follow our emotions as opposed to intellect, so every decision to convert is actually an emotional based decision. Connecting with your visitors using images that convey strong feelings such as happiness, empathy, or even anxiety and guilt will help to drive them to take action. Example: Chubbie Shorts sells Hawaiian print shirts. They’re a dime a dozen and you can buy one from hundreds of places. Chubbie Shorts realizes this, so instead of a product page that talks about thread counts accompanied by images of the shirt, they sell the experience and the emotions of what wearing the shirt could bring. Good times, great parties, and a group of adoring friends. You feel good just looking at the images and imagining yourself there. Sold? Emotions are powerful, and they work. 90% of customers say their buying decisions were influenced by online reviews. People want a third opinion. They want to feel safe and they want to be convinced they’re making the right decision. Example: Rimadyl sells osteoarthritis medication for dogs with arthritis. There’s no better way to convince visitors to convert than a powerful testimonial from a beneficiary of the product, placed above the fold on the homepage. This is a great testimonial that not only proves that the product works, but also taps into your emotions with a dose of cuteness with the image of the dog. Show off your happy customers up front and center. Chances are your conversion rates will go up. Websites can feel quite disconnected with the real world. Connect with your visitors by including pictures of real people and real faces. You should always include a picture of yourself and your team on your website. It shows the human face of your business, and creates trust with your visitors. Example: Lateral’s About Us page takes the static picture of the team a little further by having a little bit of fun and flair. Show off your business’s personality by mixing creativity and ingenuity. A real photo of you and your team builds credibility, and in turn helps increase conversion rates. Do you have any specific tips on using images that helped you improve your website’s conversion rate? Please share them in the comments, we’d love to hear from you!